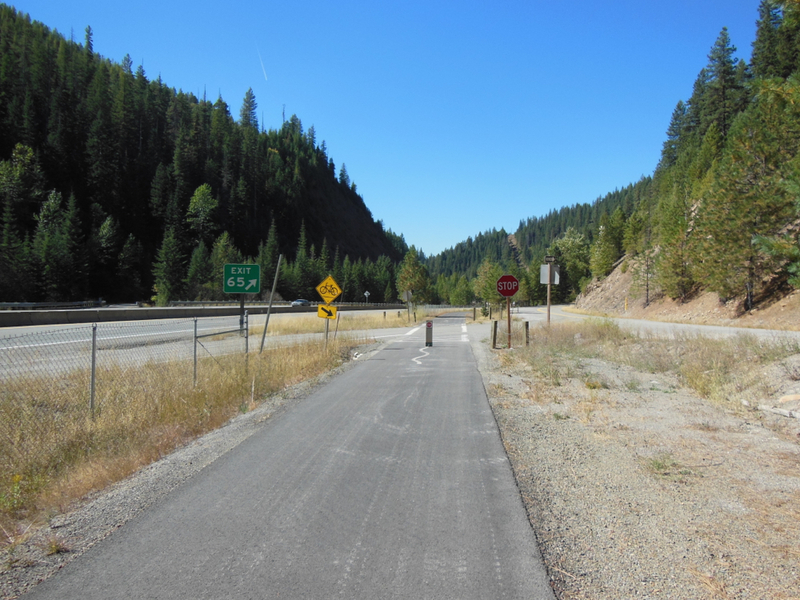 Some more comments from a recently completed 72 day, 4,100 kilometres cycling touring trip through the States of Montana, Idaho, Washington, Oregon, and California with the southern terminus being Santa Barbara. Well, I do and enjoy the opportunity to do so in the mid-western states where there are very few access limitations to cyclists. 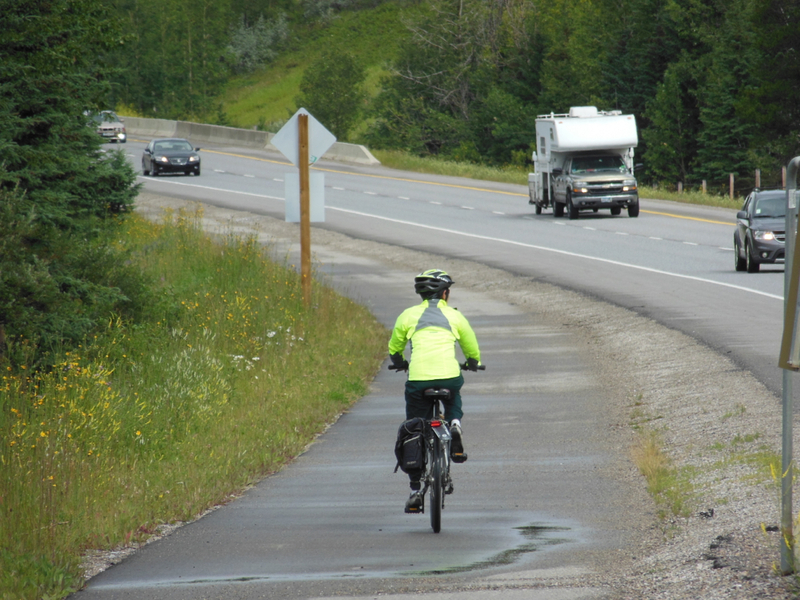 Cycling on Interstate Highways with trucks, buses, motorcycles, and other vehicles. There are many reasons for this. One does have to accept the noise of trucks, cars, and motorcycles passing continuously by. Rethreaded tire litter on Interstate Highway shoulders. Somes steel removed from the front tire of the touring bicycle. It was difficult to get out. Fortunately, no flat tire. 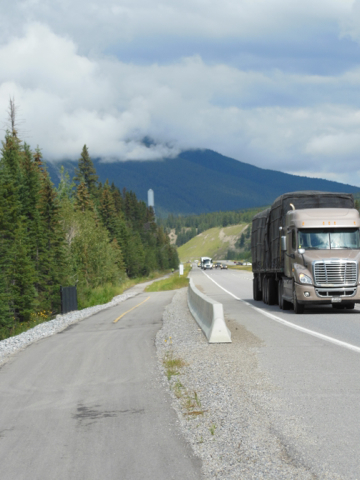 One has to put up with unmaintained highway shoulders littered with junks of rethreaded tires cast dangerously out on road shoulders by fast speeding trucks. One has to put up with risks of tire flats from the steel sticking out from these junks of rethread tires or broken off steel pieces deposited on highway shoulders. Flats can happen at the most undesirable time late in the day, during rain downpours, on steep hills, when time is getting late to reach the night’s destination, when energy has been burned up, and so on. On has to be continuously aware of other garbage thrown out of cars and trucks that could cause problems for cyclists. Ah, nothing like cycling on the shoulders of interstate highways after a cleaning. 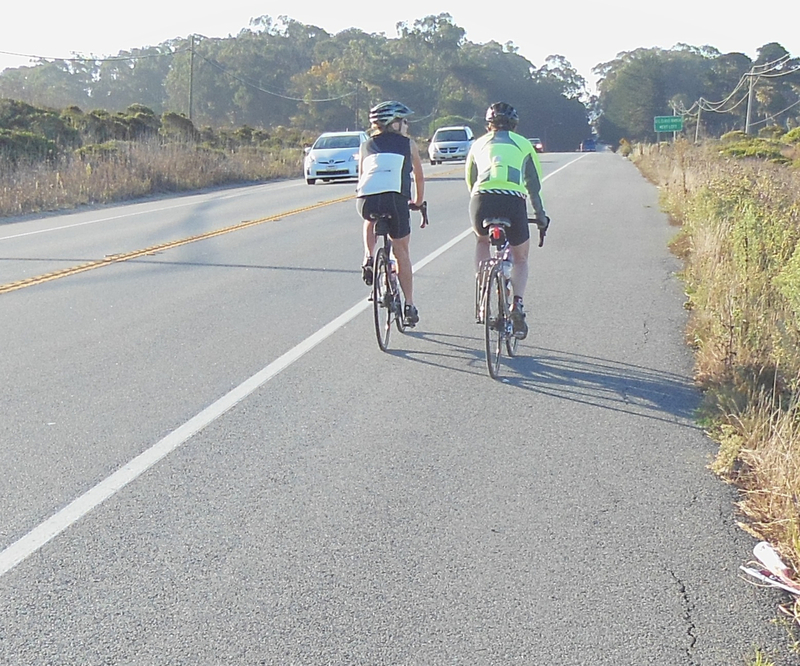 Wide shoulders on interstate highways with rumble strip separation of motor traffic and cyclists. 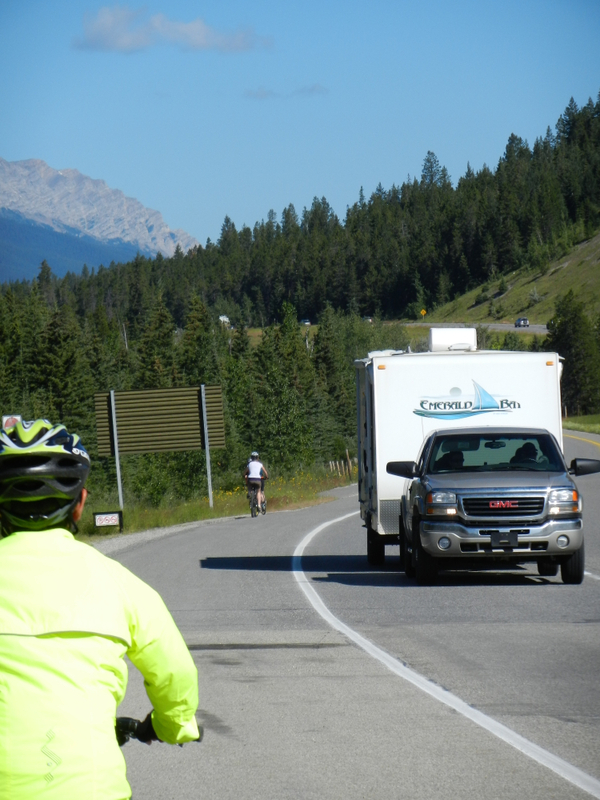 Noise from passing trucks and wind effect on cyclists. 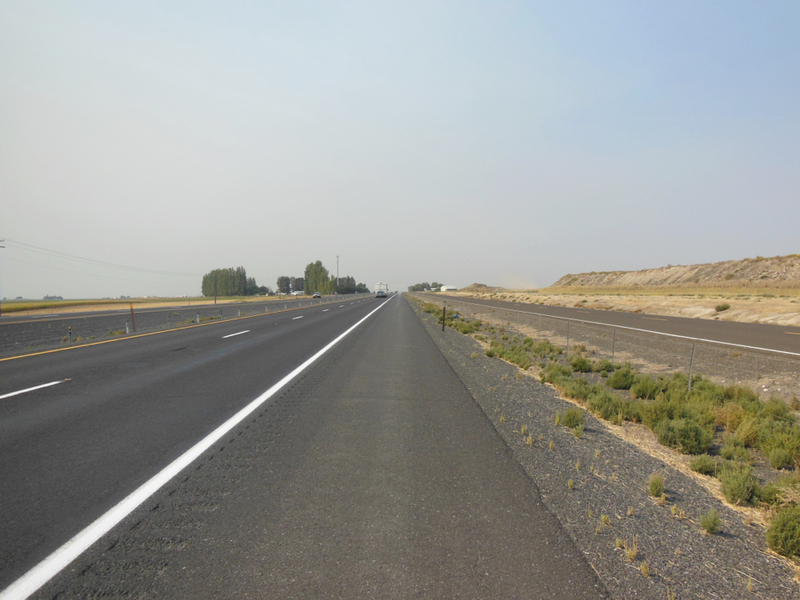 Interstate shoulders provide a cyclist with the comfort of exclusively cycling on a surface with a width of a traffic lane while separated from motorized traffic usually by rumble strips. 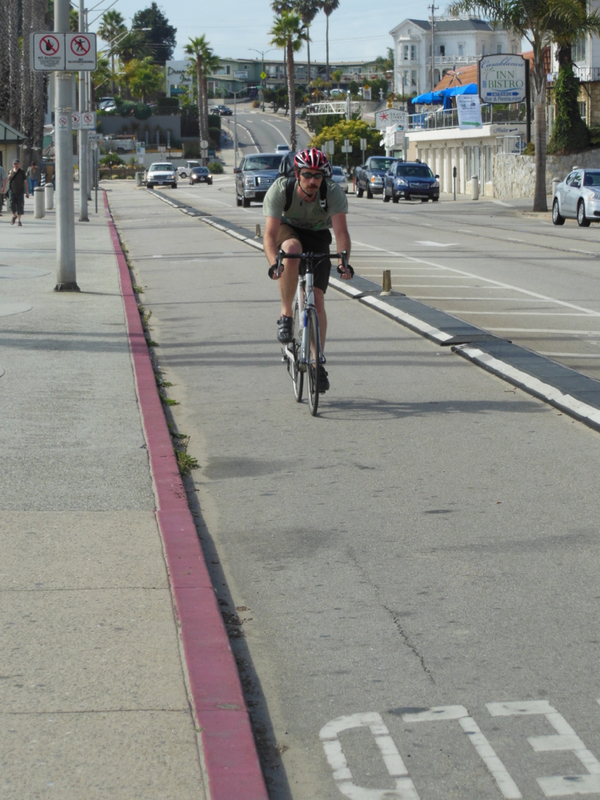 There is the glory of cycling on such a wide shoulder where passing traffic does not require attention. The noise is the nuisance not the behaviours of motorists. Wind effects of passing trucks and buses are usually nullified, except for very strong crosswinds. 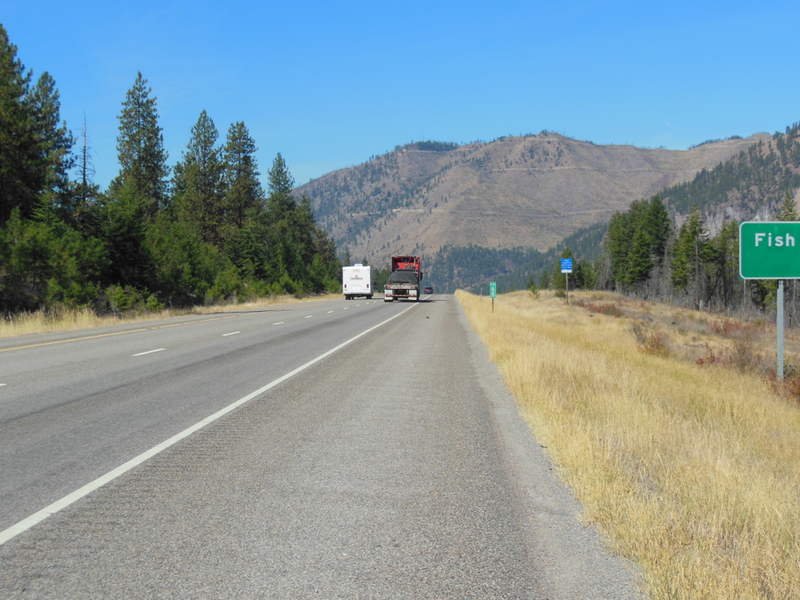 Interstate highways tend to have hills with less grade than frontage roads. 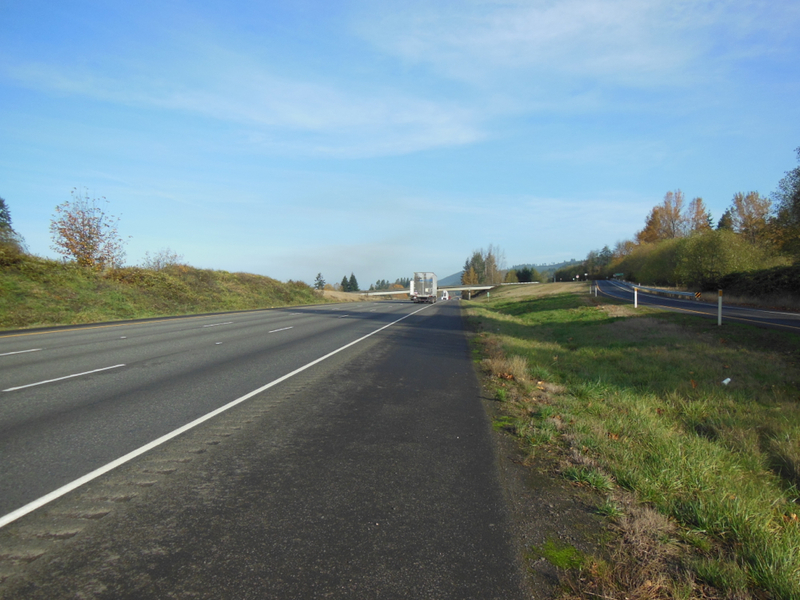 Frequently there are frontage roads next to interstate highways. How far do these roads go? 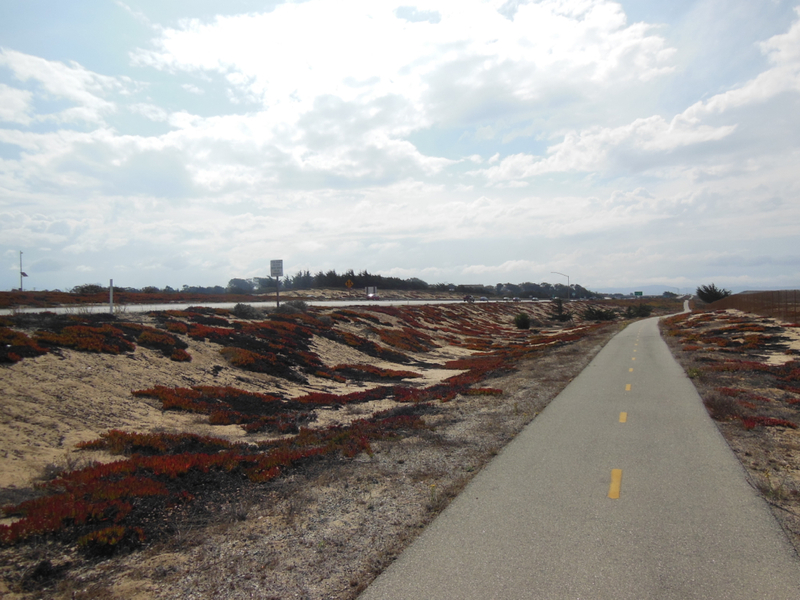 Are there intersections at the end of these roads to cycle onto the interstate highways? 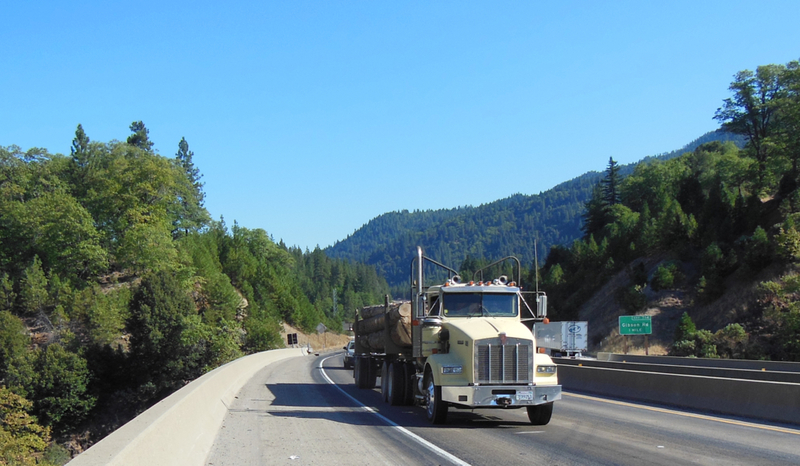 When time is a consideration, interstate highways provide a cycling surface with the least amount of grades in the most direct way to that day’s destination. 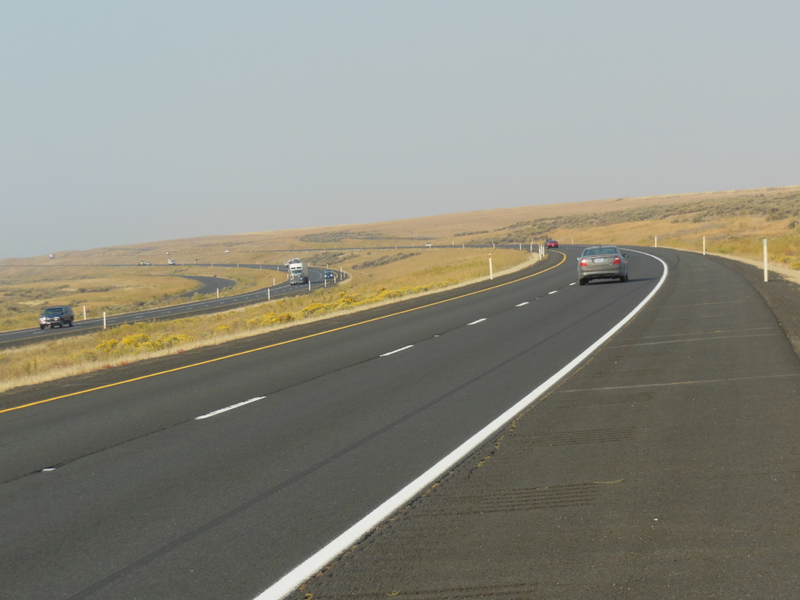 Frontage roads tend to have steeper grades and more wind, and seem to attract drivers’ speed and drift through curbs using the full road width. 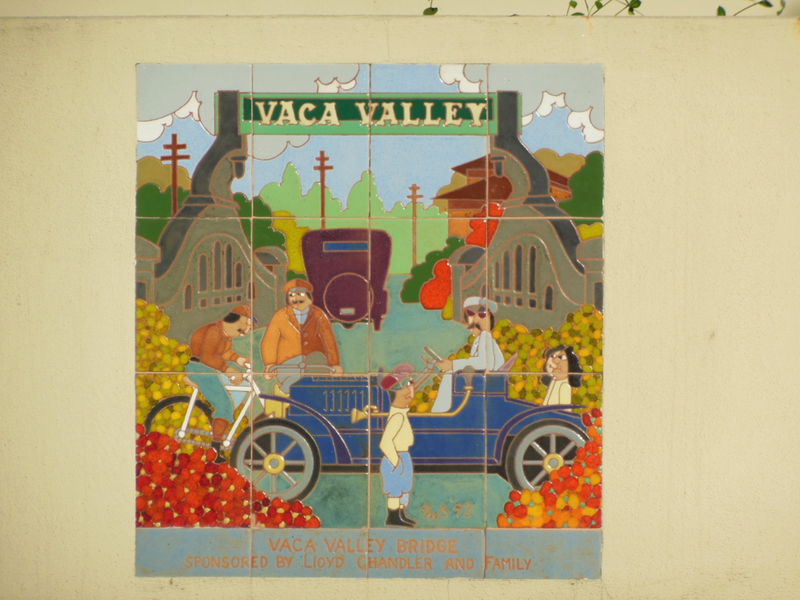 One is never certain how long there will be a frontage road and how to continue the trip without doubling back to the last intersection or lifting a bicycle and its panniers over a fence onto an interstate highway. Oh yes, one might actually come upon a convenience stop once a day on interstate highways. 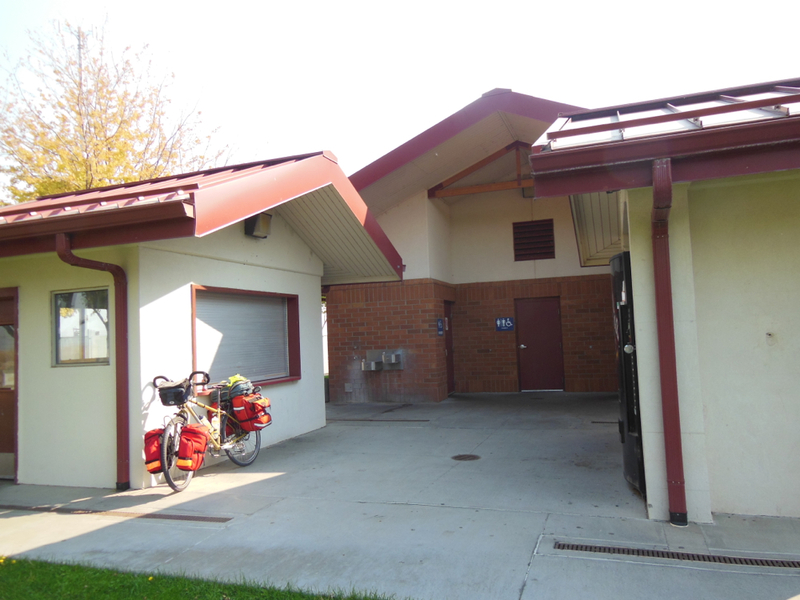 Rest stops along interstate highways. At least one for each cycling day. 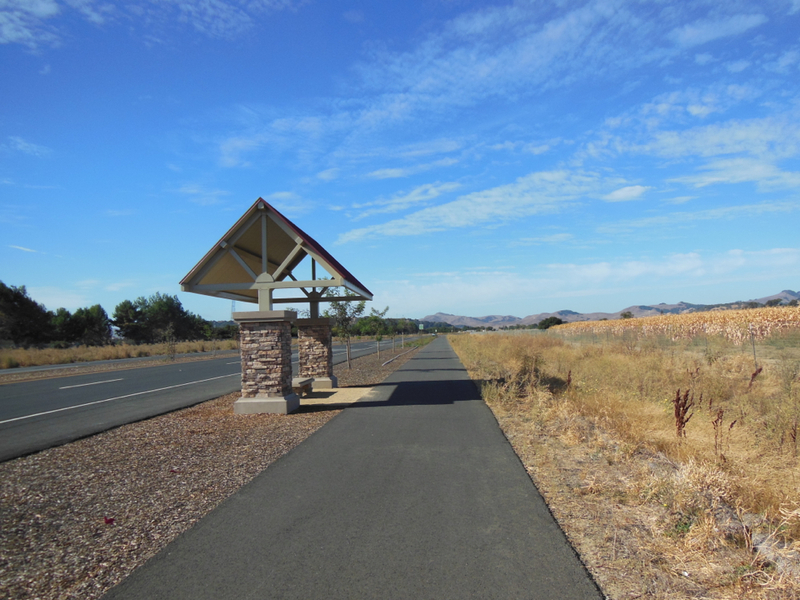 Rest stops along interstate highways. Windmill powered electricity for the rest stop. 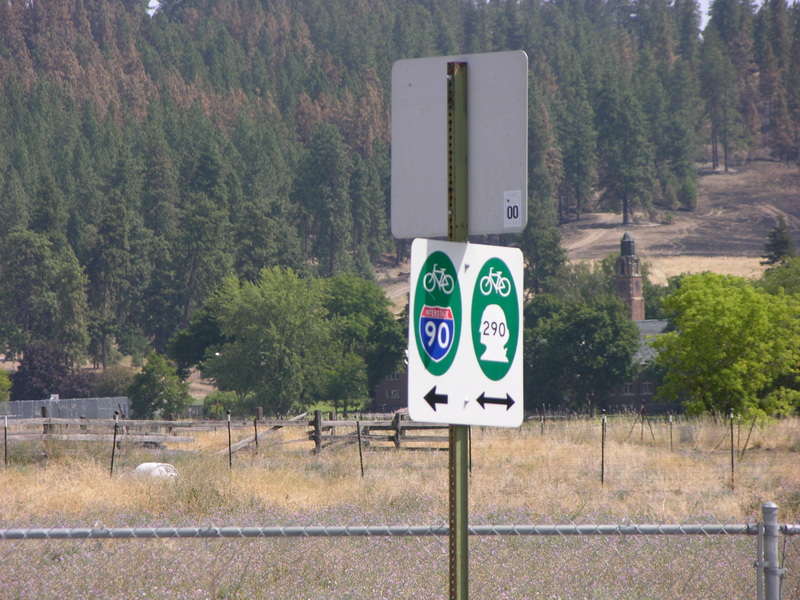 When sections of highways restricted for cyclists use are reached, some states provide signed alternate routes until they are allowed back onto the interstate again (I-90 Bike Trail, for example). 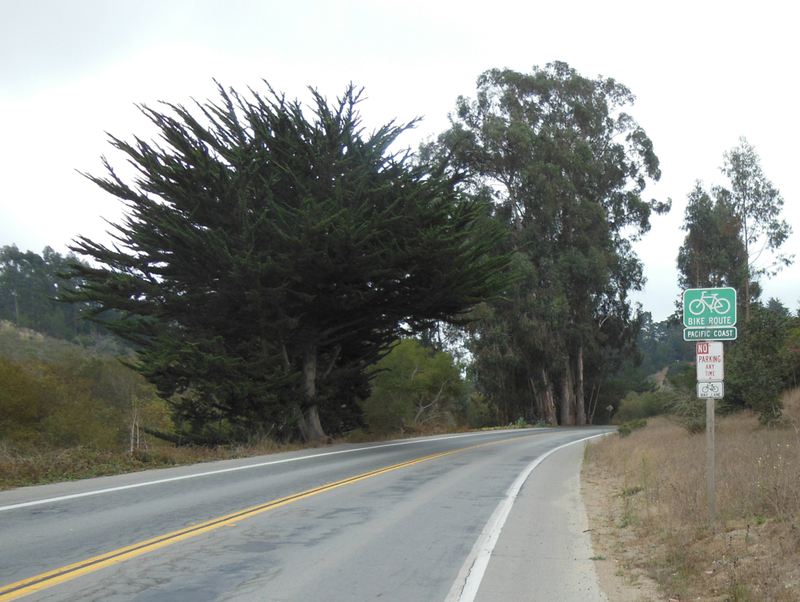 The sign that cyclists hate to see when on a trip. 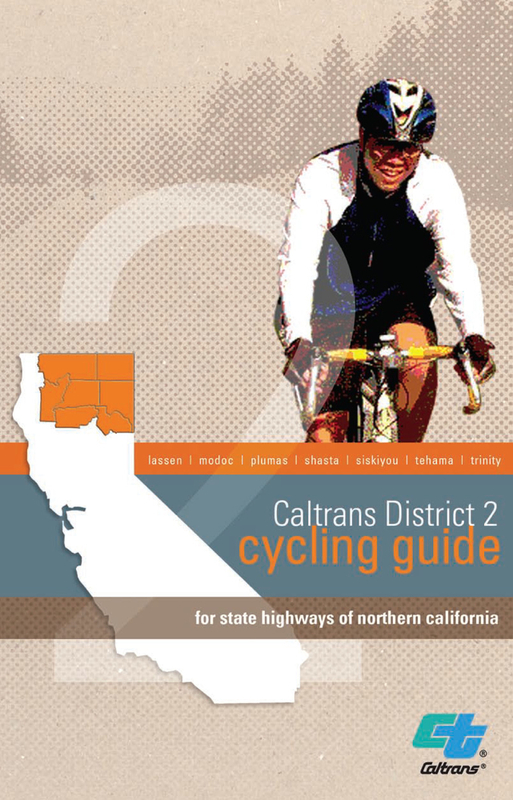 Cycling on interstate highway is restricted. Alternate cycling route is signed. 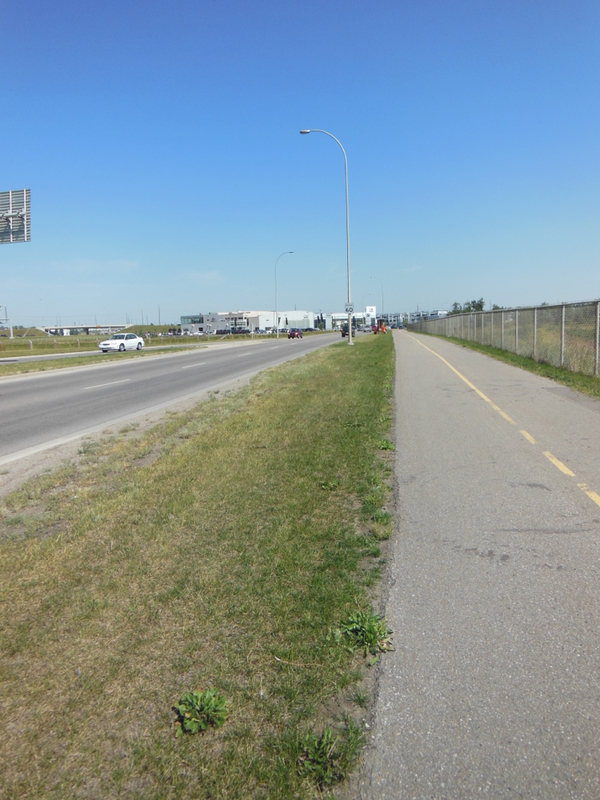 An alternate cycling routing along a bike trail parallel to an interstate highway. 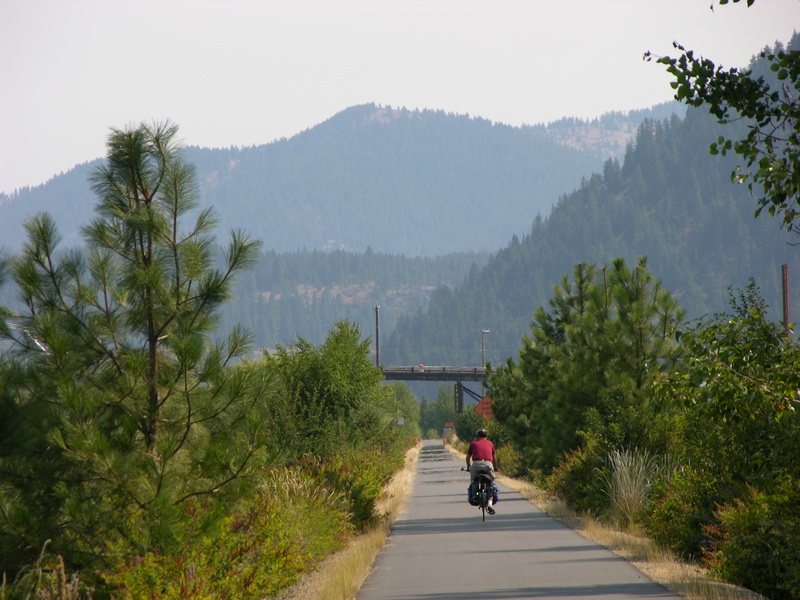 The Coeur d’Alene Trail parallel to the I-90. So, when there are no alternative roads readily available, interstate and other restricted-access highways provide more direct routes for cyclists. 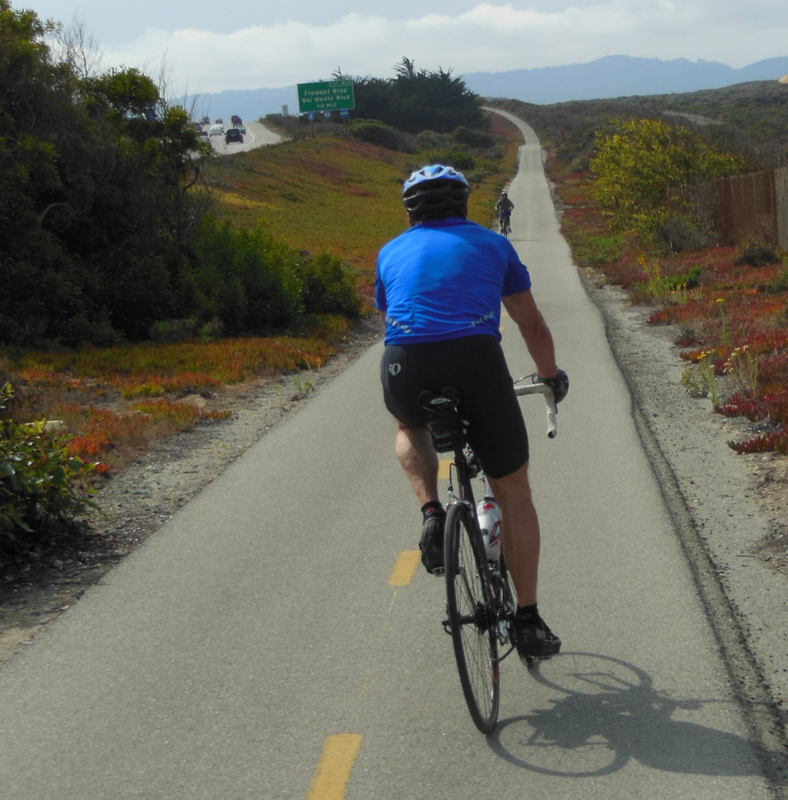 When the scenery is the same for all parallel roads, then interstate highways provide less demanding hills for cyclists. Interstate highways with wide, paved shoulders, with wide shoulders or bike paths on bridges, with rumble strips providing separation between motor vehicles and cyclists, with maintenance programs calling for frequent removal of debris from highway shoulders, with convenience stops comfortably spaced apart for senior-aged cyclists, with signed, alternate cycling routes for section of highways restricted to cycling, with underpasses at high-traffic intersections, then these highways provide a pleasant alternative for cyclists who can handle the noise. Government banning of rethreaded tires would also take away the concern of flats on trips, especially for those cyclists that are not adept at changing flat tires or would not make a trip by bicycle because of fear of flats. 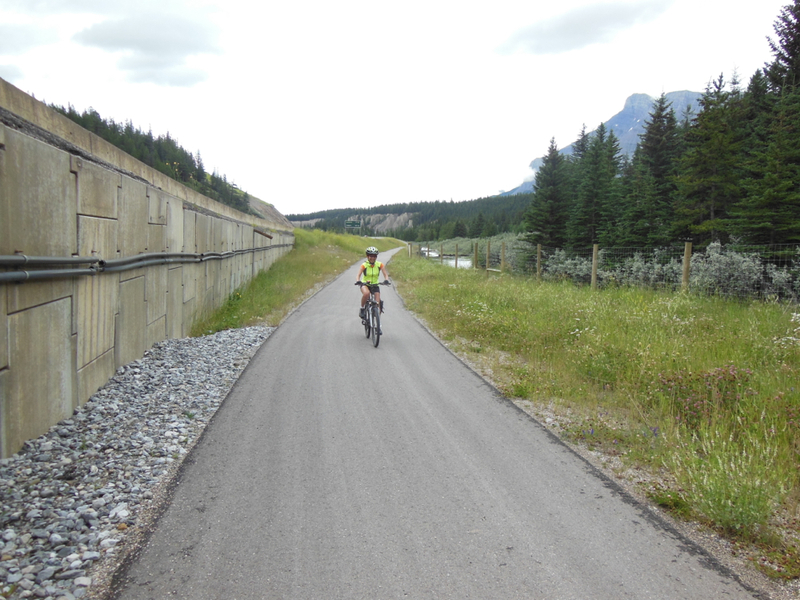 Banff Legacy Trail – Part 5 -An Afterthought! A Reminder! 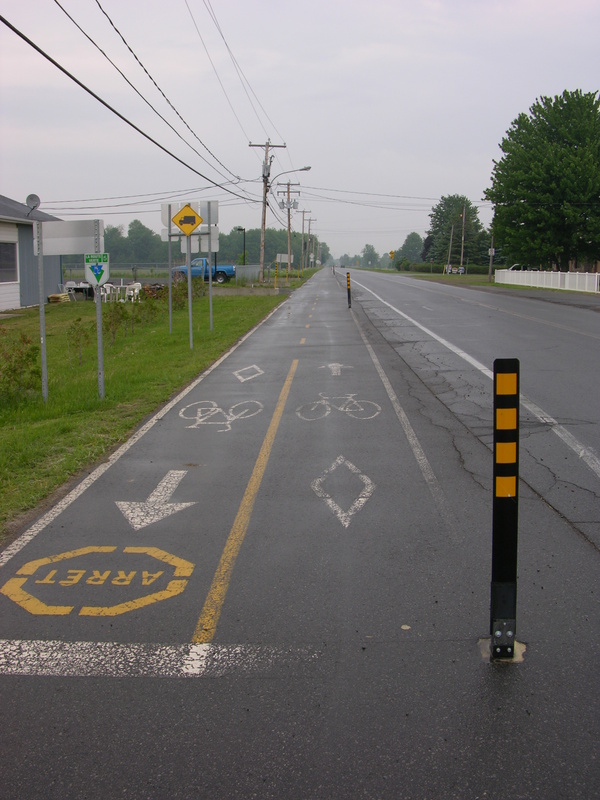 Why should there be physically separated bike lanes on major highways or horizontally separated bike paths on highway right-of-ways? Why are they needed? Why are wide shoulders not enough? Should the shoulders be paved? 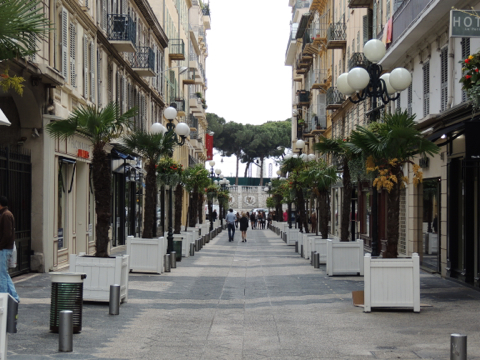 Then, what should be the width of paved shoulders? 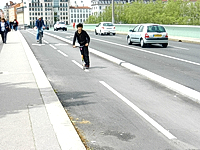 – Minimal 1 metre; minimum bike lane width of 1.5 metres; more comfortable bike lane width of 1.8 metres that would attract more people to cycle; bike lane width supporting social cycling with minimum of 2.2 metres but more desirably 2.5 or 3 metres; width of 2 metres plus that would negate the wind effect on cyclists of trucks or buses passing at high highway speeds; width that would allow for cyclists’ avoidance of road dirt on shoulders caused by passing trucks, snow clearance, etc. 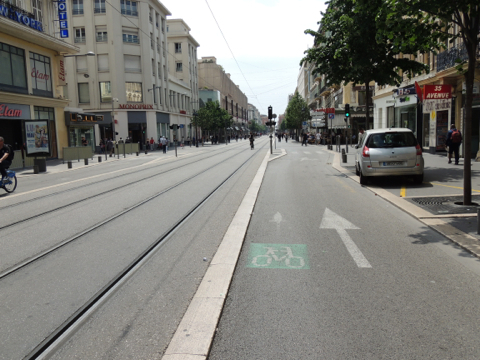 Should the road shoulders just be marked for cycling on the pavement or signed as a bike lane or both? 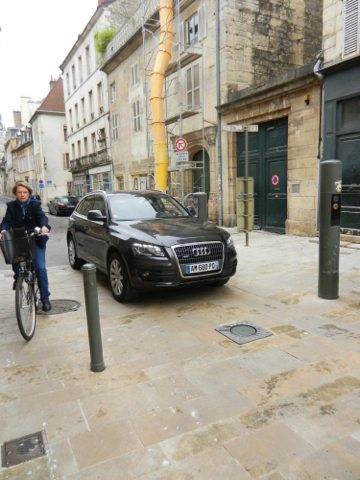 Should there just be paved shoulders with no cognitive demonstration to motorists that cyclists may be present? 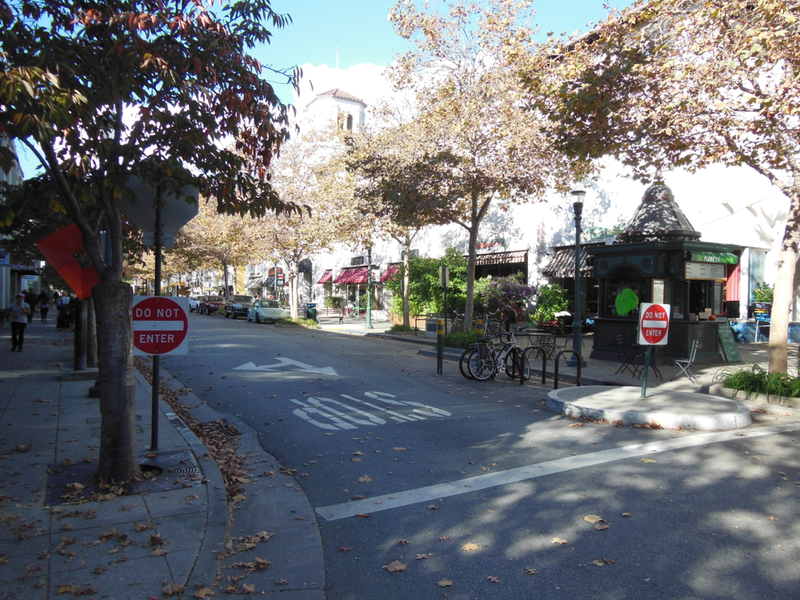 Should the separation simply be painting providing a virtual buffer that can be transgressed by motor vehicles poorly driven and drifting into the cycling space or used by motorists for temporary stopping or parking? 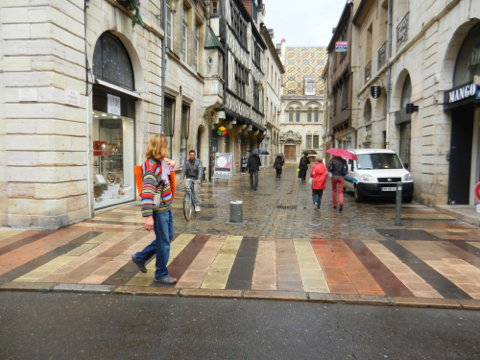 Should there be physical separation or barrier between cyclists and the rest of the road pavement users? 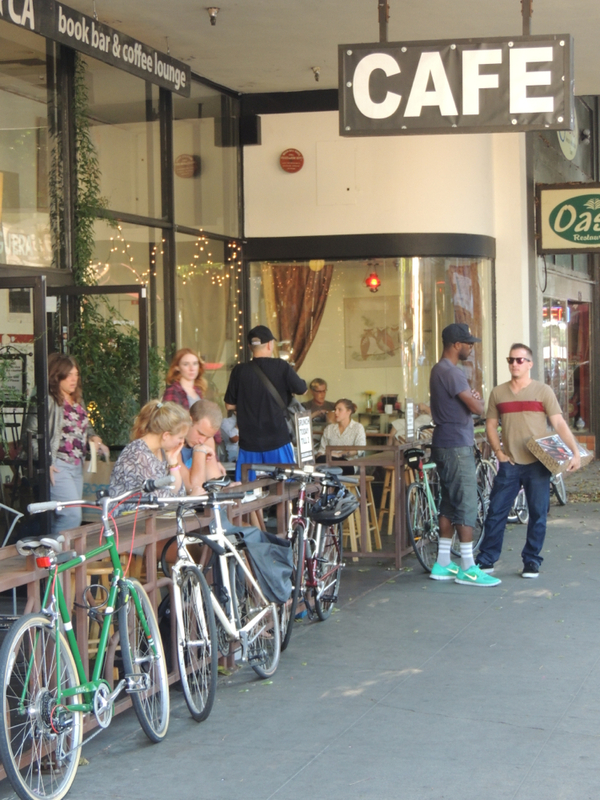 Should there be physical separation instead with bike paths within the road right-of-way removed from the general traffic lanes? 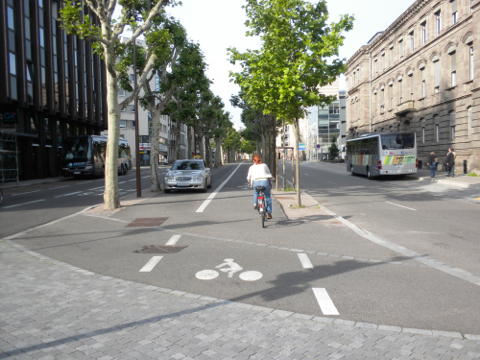 Should physical separation provide one-direction cycling on each side of roads or two-way cycling on one side of roads? 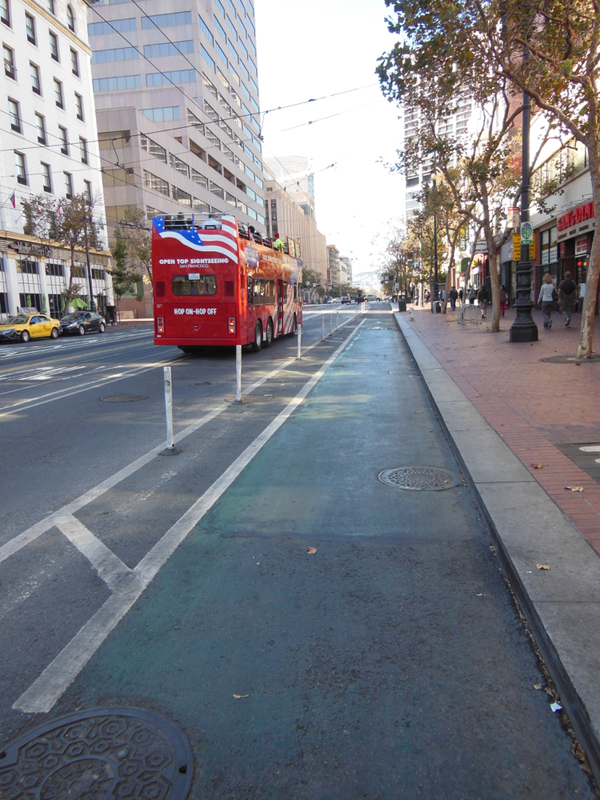 Instead, should there be a bike trails on their own separate right-of-ways, removed from any roads? 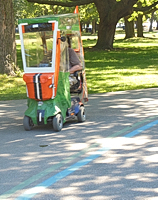 Should the roadway be a shared facility with sharrow markings? 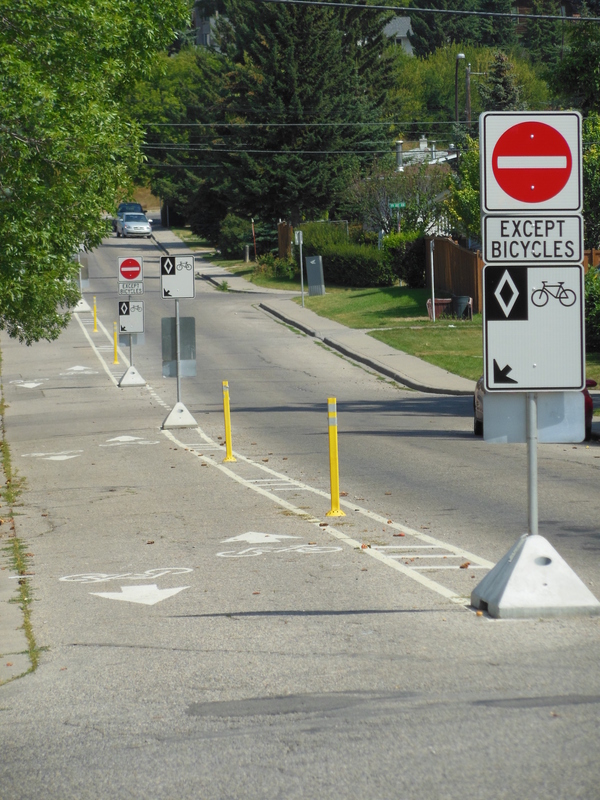 Is it enough just to put up bikeway signs on arterial, collector, and neighbourhood streets? 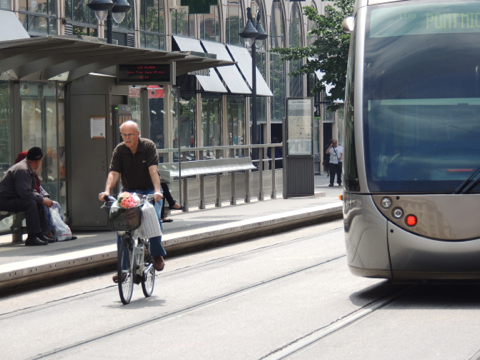 Sign it and people will be drawn to cycling being the operative strategy or belief. 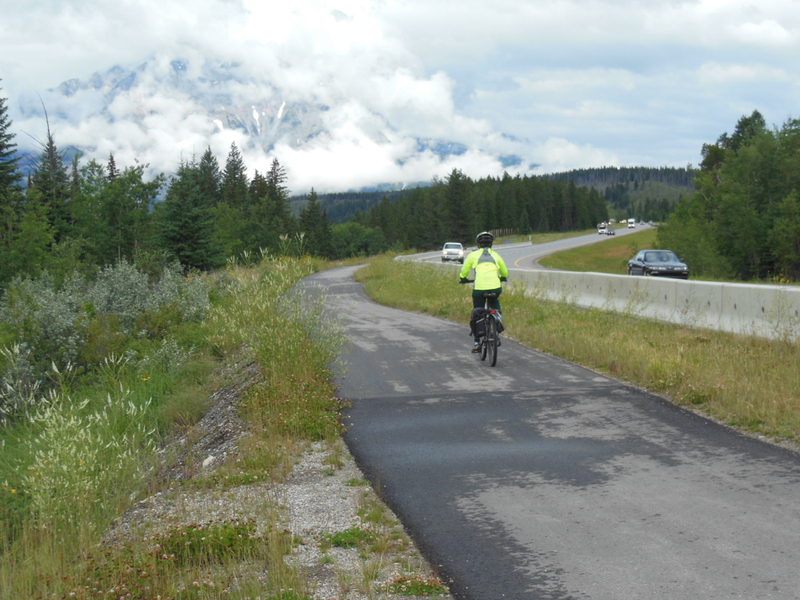 Banff National Park of Canada; Banff Legacy Trail; From Canmore to Banff – Choice – cycle on paved, wide shoulders of the Trans-Canada Highway #1 or cycle on this bike path along the highway. In the discussion, there is something important missing. 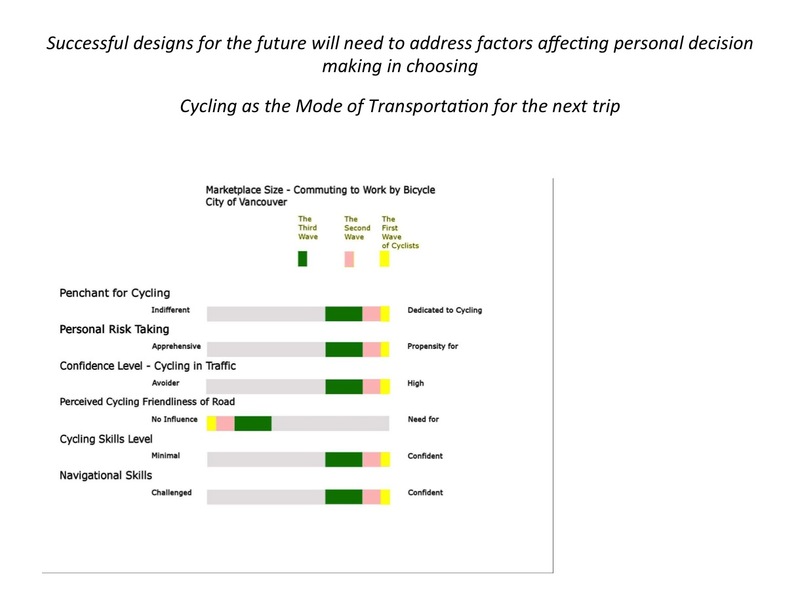 What seems to be missing is a dialogue on factors that affect design that would increase cycling traffic and encourage people to leave their cars at home and do trips by cycling instead. What seems to be missing is the dialogue on what will attract non-cyclists to move towards cycling. What seems to be missing is translating factors that hold back people from cycling into cycling infrastructure design and network design. 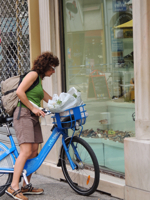 Penchant for Cycling Model – Personal influences that affect the decision to cycle. 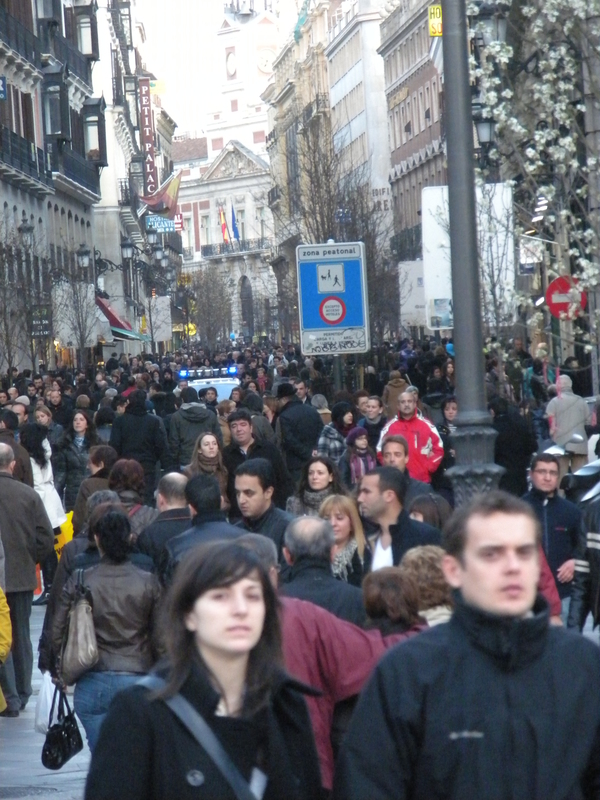 Personal confidence, personal propensity for risk-taking, personal considerations, personal convenience, degree of cycling skills, navigational skills, perceived cycling friendliness of roads, mechanical skills for maintaining or repairing bicycles, trip considerations, topography and environment considerations that limit attracting people to cycling are some of the factors that need to be overcome, which affect infrastructure and network designs. 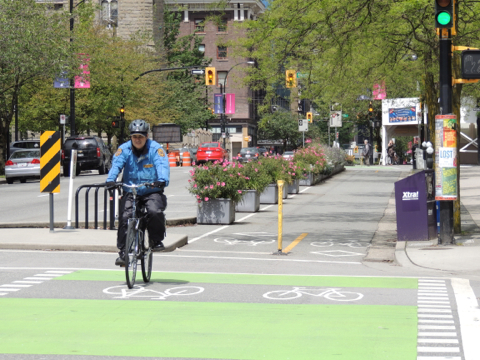 Targeting a portion of drivers for potentially inducing them to cycling instead may be more fruitful rather than designing for current cyclists if the objective is to get cycling traffic activity to grow substantially. 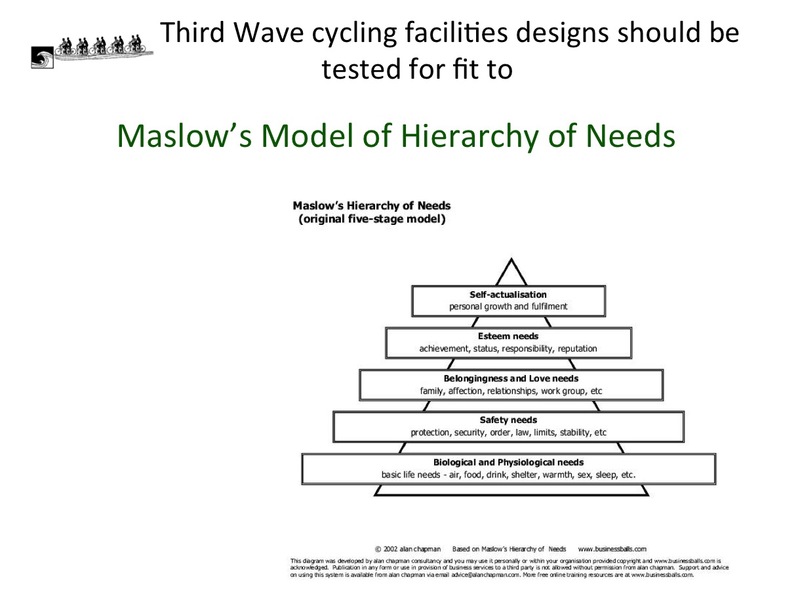 For designing, the Maslow model of Hierarchy of Needs may be useful to keep in mind. Maslow’s model of personal Hierarchy of Needs – A theory of self-actualization; the bottom layer of needs must be satisfied before other needs are addressed. Nothing fazes people more than the thought of being stranded on a highway many kilometres from civilization. Not all people carry cell phones to call for assistance. 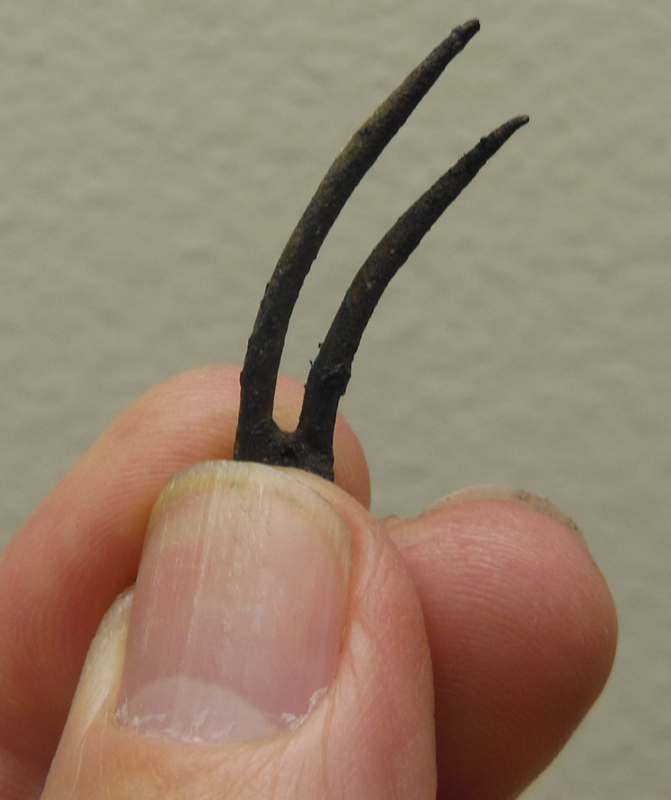 Clumps of truck tire pieces straddling road shoulders are a prime cause for cyclists being stranded, as steel pieces separating from these rethreaded tires pieces litter road shoulders. Then, cyclists face the task of repairing a tire. 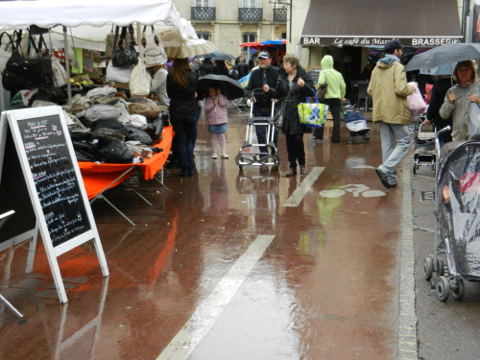 Sometimes the weather is not too kind with wind, rain, cold, or darkness posing an uncomfortable environment for the task. Some people are not inclined to repair flats; so potential for flats is enough discouragement for cycling. Law banning rethread tires and very frequent (weekly, at least) shoulder sweeping would reduce the probability of such flats. Now, will this really happen in the political environment that is with us. 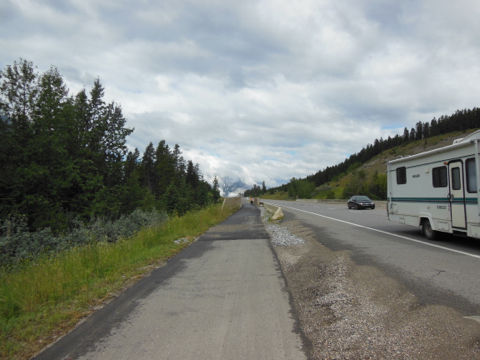 Trans-Canada Highway #1. 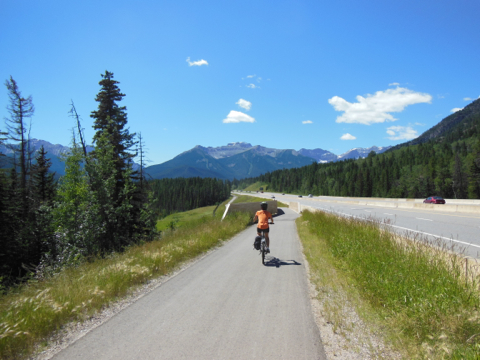 Calgary to the Rockies – Wide paved shoulders. 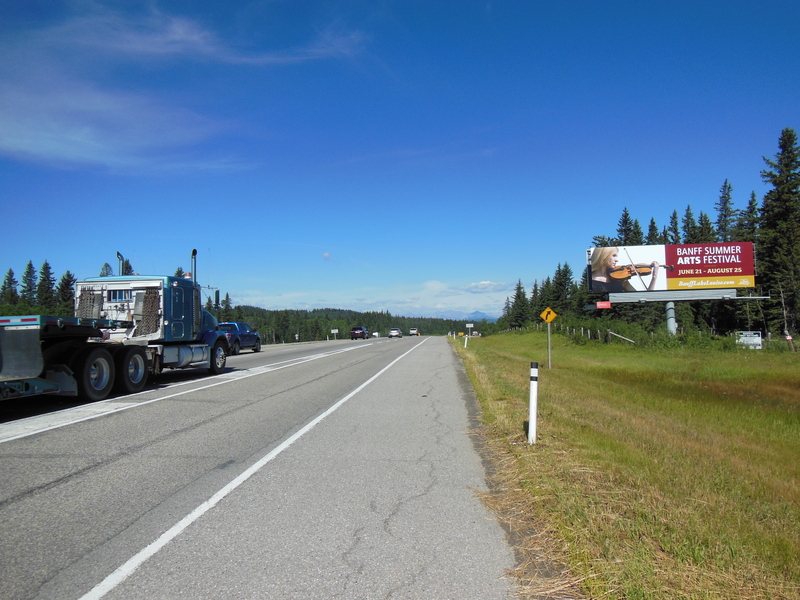 Wide paved shoulders of 3 metres plus, lower highway speed and its observation may offset some risk as the distance that trucks hurl discarded tire pieces is dependent on vehicle speed. 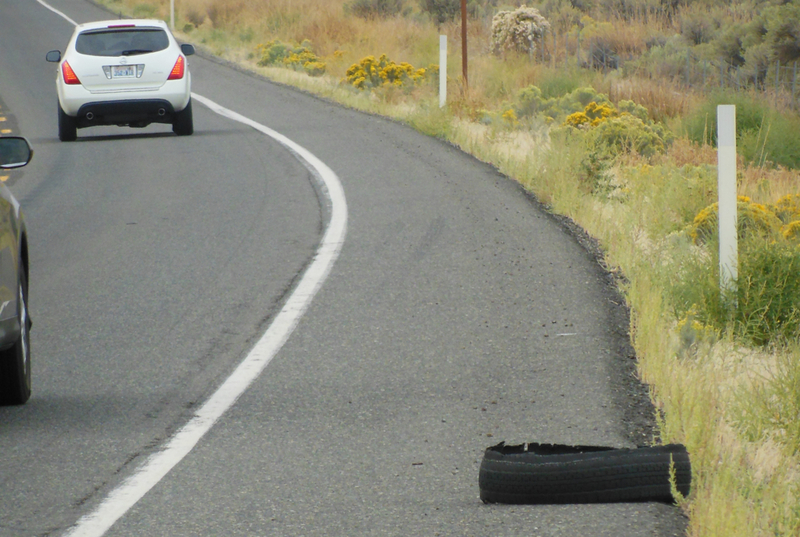 Rethreaded tire garbage tends to litter highway shoulders primarily within 1.5 to 2 metres from outside lane lines. More realistically, physical separation of cyclists and drivers is a real solution that would attract more people to cycle. 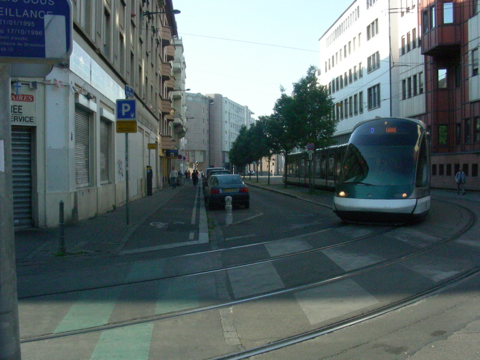 Such separation needs to be accompanied with impermeable physical barriers if cycling is right adjacent to traffic lanes or with vertical separation by distance that bike paths on road right-of-way provide. 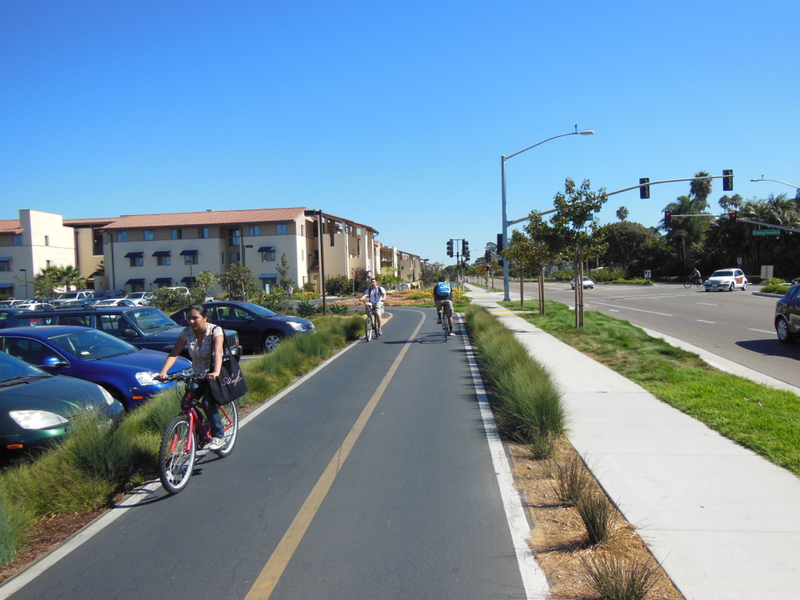 Of course with the absence of truck traffic, bike trails eliminates the potential of flats from rethreaded tire pieces. Rethread tires pose another danger to cyclists. With speeds of 100 km or more being frequently undertaken by drivers, the lateral discarding of rethreaded tire pieces causes a missile effect as the pieces are dispatched to road shoulders. Would one want to be in the way of a 100 km baseball pitch or a rethreaded tire piece? It is bad enough to be unfortunately in the way of a rock being projected by a car, which just happened to cleanly shear off a bicycle tire stem during a steep climb. The potential danger to cyclists during the act of a truck tire casting off a rethreaded piece is real. Fortunately, the probability is low. Of course, if you are unfortunate to be in the way, statistics become meaningless. Potential cyclists seeing the highways littered with rethreaded tire and other garbage cast off by trucks, cars, and snow clearing activities is enough for some to consider cycling on these types of roads as not the thing to do. 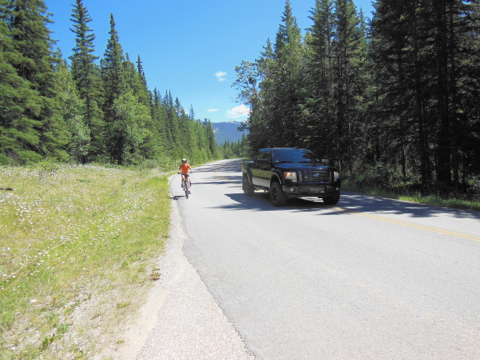 A blast of wind from a high-speed truck or bus passing by is enough to unsettle many cyclists and a discouragement for the less risk-takers to cycle on fast speed roads. Strong cross winds can increase the intensity of the wind’s slipstream unnerving the less confident cyclists. Sometimes, one needs to cycle towards passing vehicle to stay on the road, during very strong winds. Otherwise, the verges will great you. 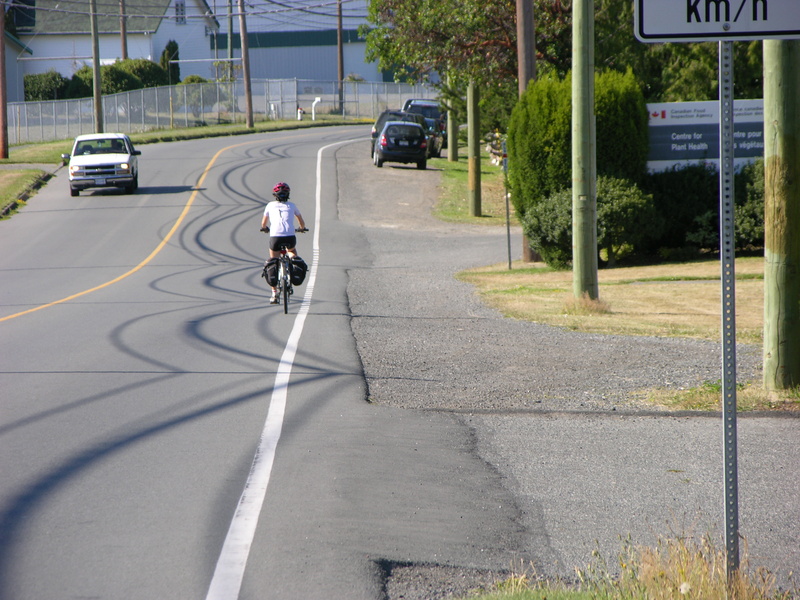 The wind envelope from large vehicles, such as trucks and buses, has been well documented but not considered in designing for cycling along high-speed roads. 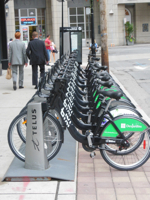 Some research has been done on the effect of poor quality air or emissions emanating from motorized vehicles on cyclists adjacent to these pollution producers. 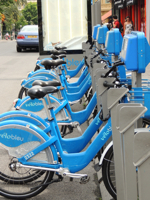 Results has shown that cyclists are polluted less if removed from a car by a metre and more so, if farther away. 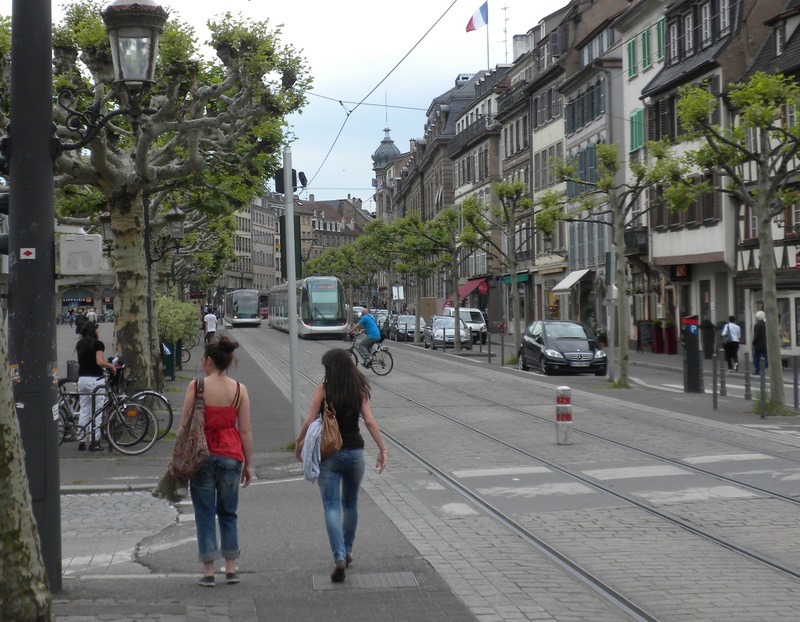 One study focused on relationship of air pollution on neighbouring streets to arterial streets and found that the pollution is less. So, it seems that the amount of pollution present that was emitted from cars, trucks, buses, and other motorized vehicles is dependent on distance and decreases as the distance increases. More research is required to fully understand the linearity relationship of distance and the amount of pollution absorbed, the pollution bubble. 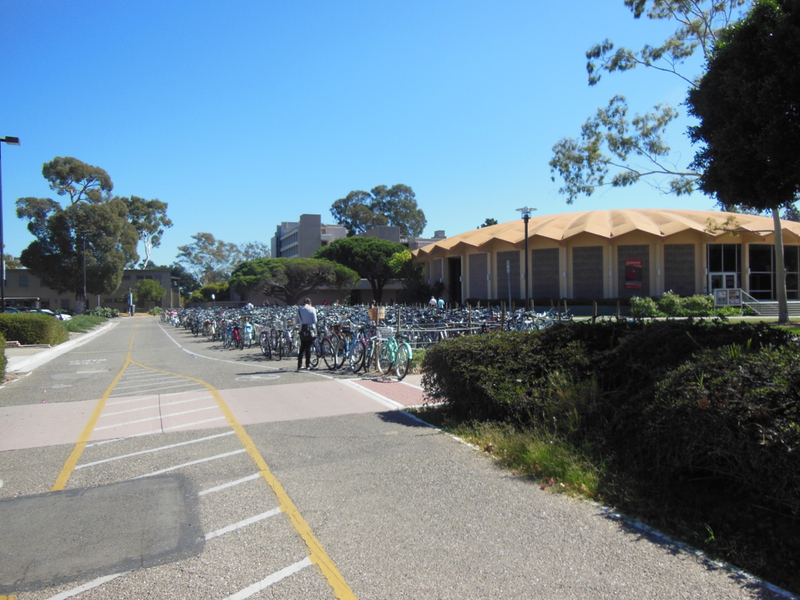 The research supports the use of bike paths on road right-of-ways and off-road bike trails for decreasing the effect of pollution on cyclists. In 2006, I came to realize the effect of highway noise on people. Until then, I just saw it as undesirable noise and put it aside. 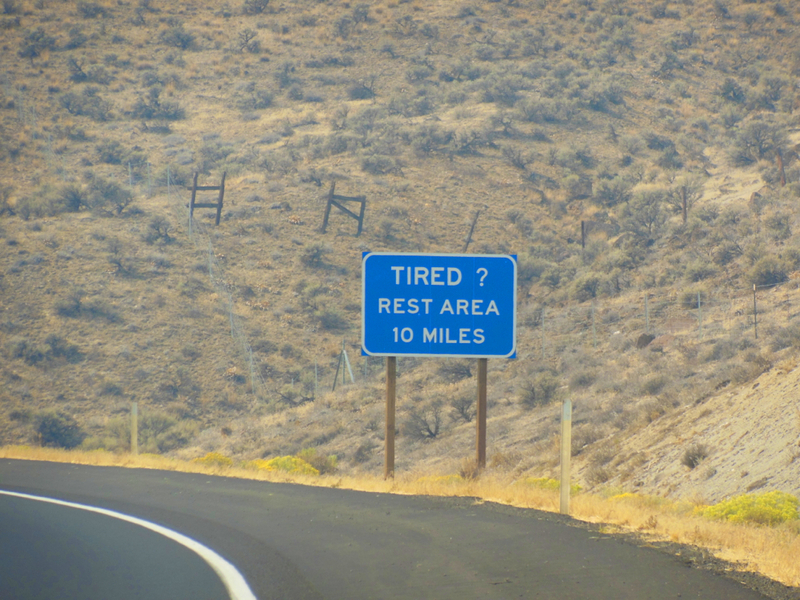 On a trip from Vancouver, B.C. to Chicago, IL, I saw the impact that noise can have on a cyclist as I watched my cycling colleague suffer with each passing truck and cars. 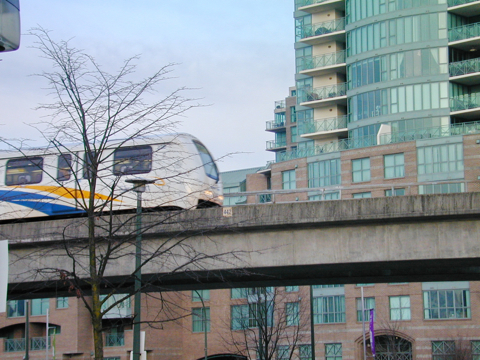 Noise emitted from cars, tracks, and buses has an envelope and dissipates with distance. That noise envelope is not well understood. There is need for clear documentation of the model. 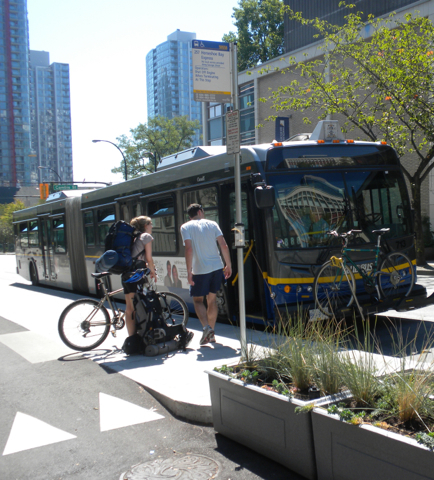 The model needs implementation with any work done on any road or any bike paths being built. 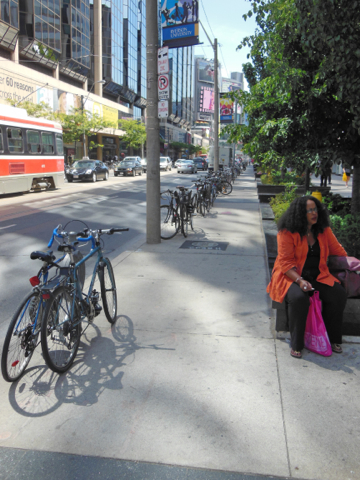 The effect of noise on people needs to be eliminated or much reduced for cycling infrastructure. 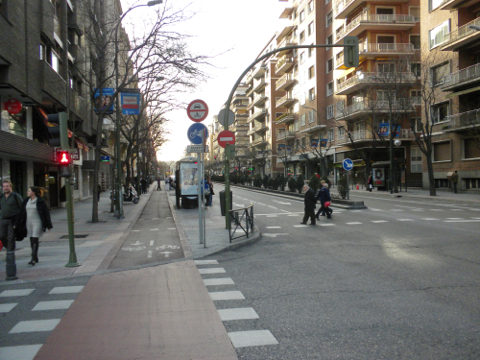 Proper application of the noise envelope will have direct impact on cycling traffic volumes. 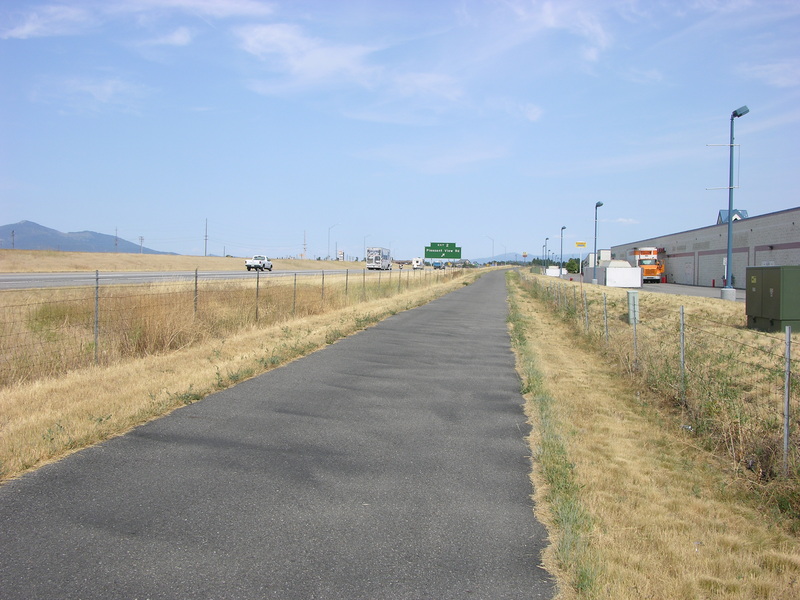 Interstate Highway 90 Bikeway; Spokane WA to Coeur d’Alene ID – bike path paralleling the highway; concrete barrier separation with fence. 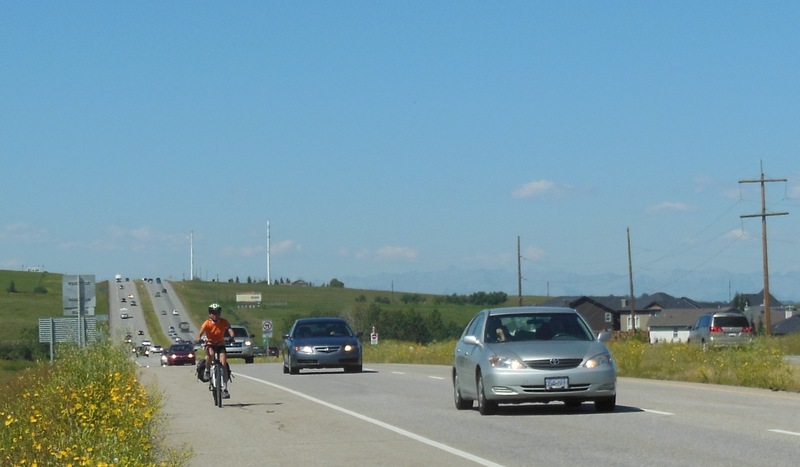 For highways, there are good arguments that cycling will be encouraged if wide shoulders, bike paths, or bike trails within 500 metres of the traffic lanes are provided. 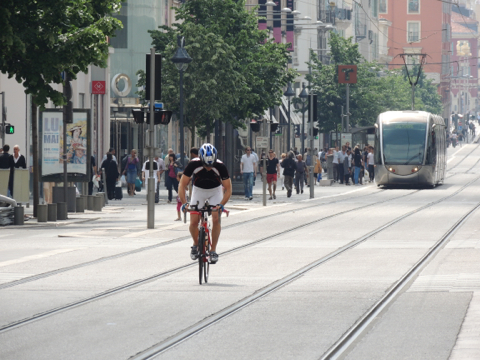 Wide shoulders will only entice a smaller number of potential cyclists. 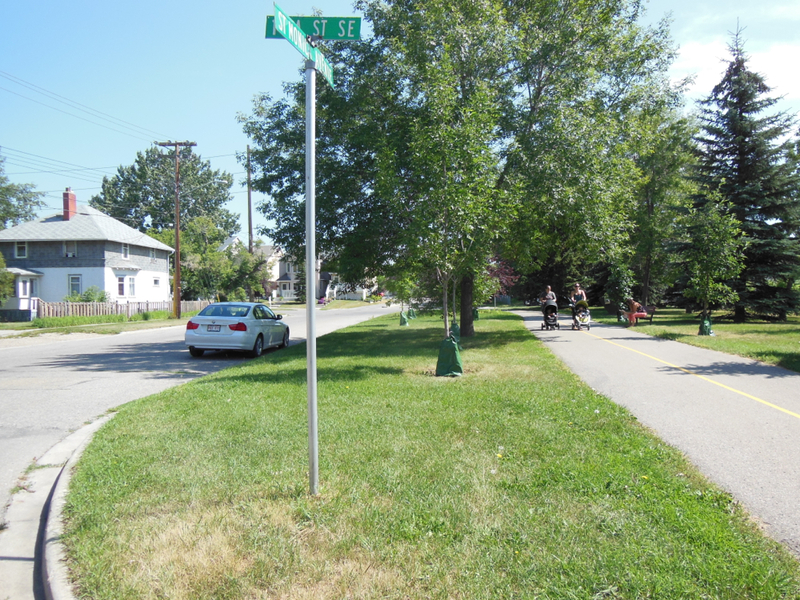 The number will grow as bike paths on road right-of-ways are provided and even more when bike trails are provided within the cycling catchment area of roads or about 500 metres. 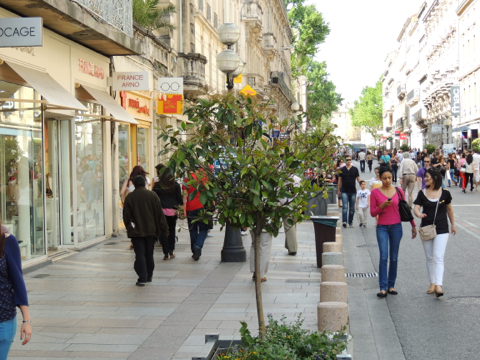 Road garbage, wind effect, air and noise pollution will have been reduced or eliminated. There are other justifications for physical separation and the wider separation the better. Some of these are economic and others are local retail business contributors. 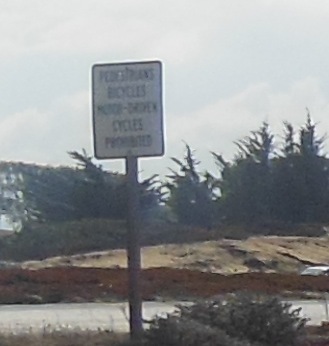 Of course, only paved paths should be considered. 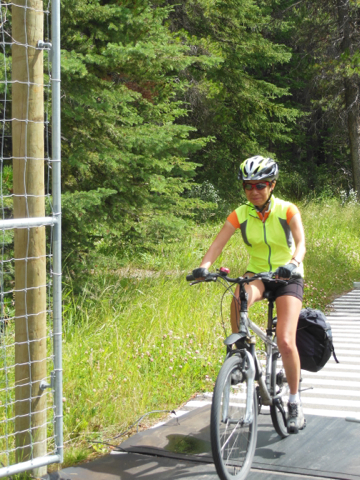 Research has shown that gravel paths require 30% more energy than paved paths. 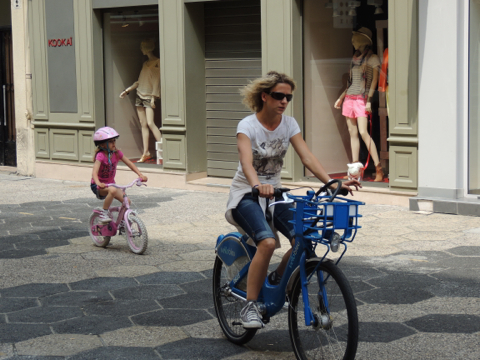 30% more energy is sufficient to dissuade many not to cycle or cut daily distances down where touring does not become feasible. 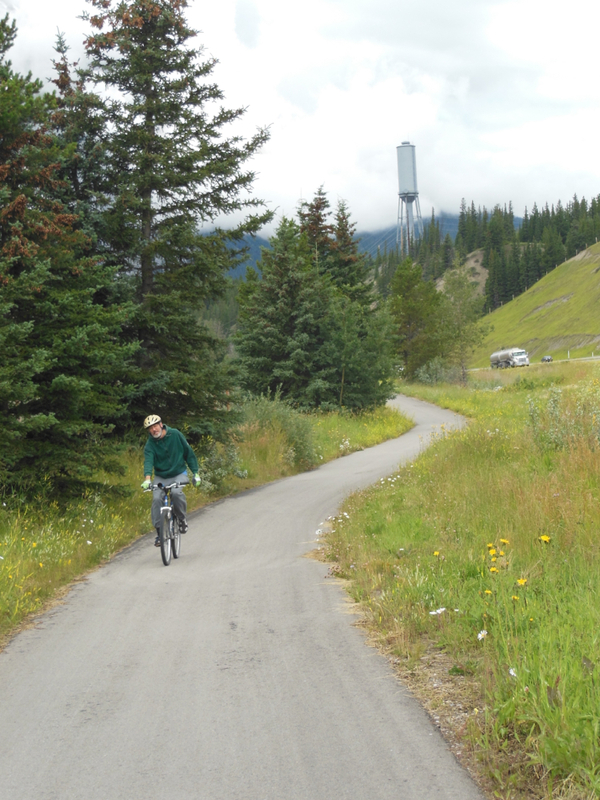 Two-way bike paths and bike trails open up the potential for increased business along the cycling facilities and their destinations during low cycling periods when the paths and trails would be covered by snow. Snowshoeing and Nordic skiing become a use of these facilities, a tourist attraction, and reason for coming to the area. 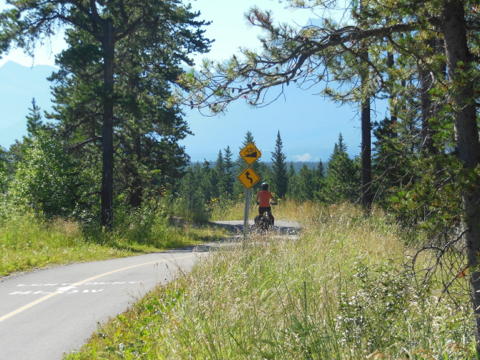 For more remote cycling infrastructures, considerations should be given towards drawing in local economic benefits that snowmobilers bring. Defiantly, ATV’s should not be allowed on these facilities considering their demonstrated history of destructiveness to trails. 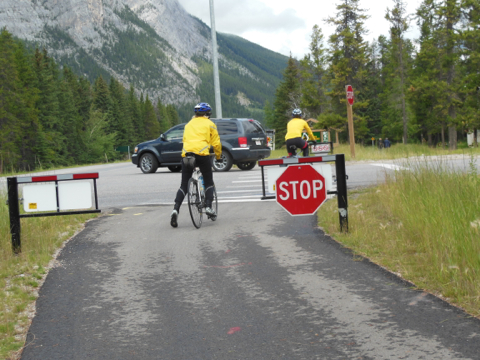 The Banff Legacy Trail is a fine example that separation increases cycling traffic. 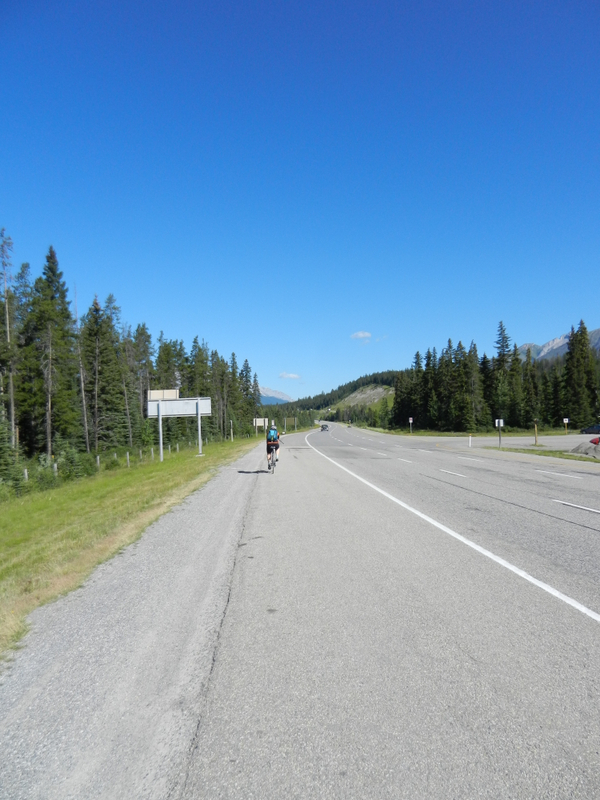 After all, there are excellent wide shoulders on the Trans-Canada Highway where we used to cycle on in less cycling numbers than we experience on the new trail now. Vermillion Lakes – Bear in area warning. 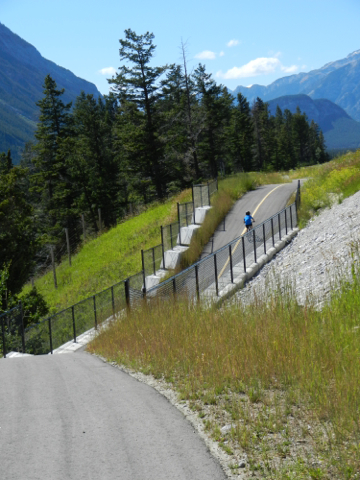 The trail continues through the town on designated streets towards Mount Norquay Road and the Vermillion Lakes Road located on the west side of Mount Norquay Road just before the ramps to the Trans-Canada Highway. Vermillion Lakes Road dead-ends just past the lakes. The roadway provides people a chance to see the lake, Banff on the other side of the ponds, and Mount Rundle. Chances of spotting animals are also there. 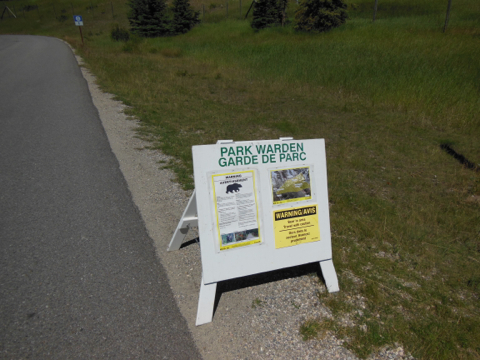 For our trip, the Park Warden had put up “Bear in the area” warning signs. Black or Grizzly bear was not stated, just bear. Sorry, we did not spot one. 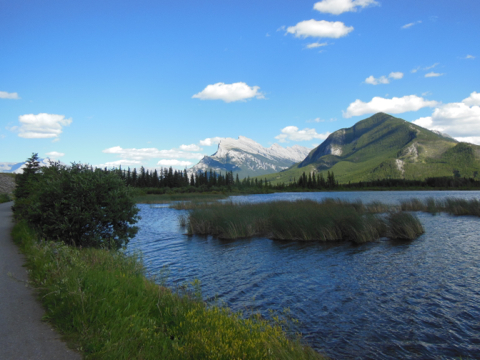 Vermillion Lakes Road and Rundle Mountain. 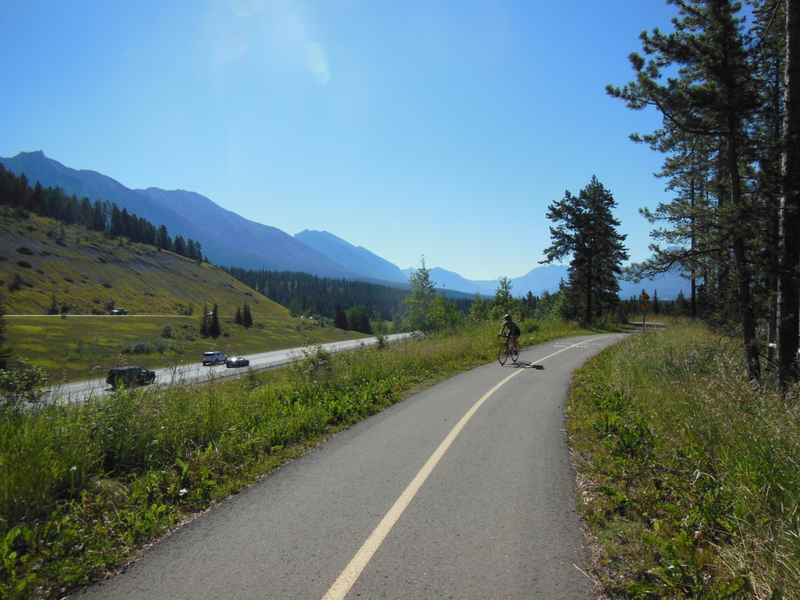 Then the Legacy Trail continues as a bike trail connecting to the Bow Valley Parkway. 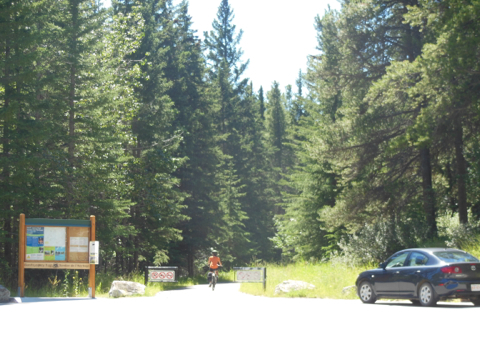 Bike path entrance from Vermillion Lakes Road to Bow Valley Parkway. 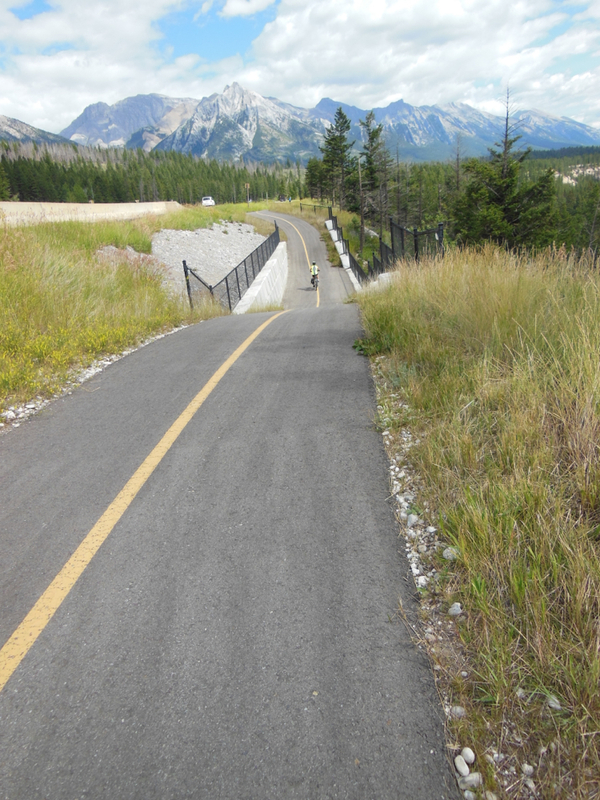 Bike path from Vermillion Lakes Road to Bow Valley Parkway; paralleling the Trans-Canada Highway. 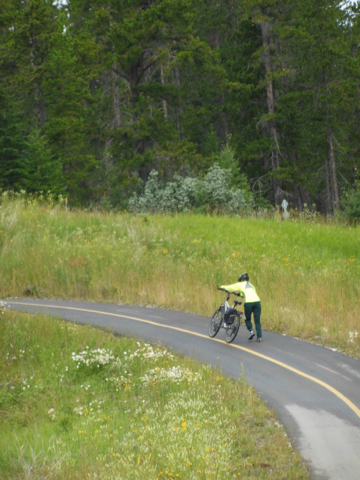 Cyclists can continue to enjoy their connection with nature, the mountain scenes, and local animals by cycling the 50 kilometres to Lake Louise on this parkway. Elks are not uncommon inhabitants along this road. Mule and whitetail deer, wolves, coyotes, big horned sheep and mountain goats may also be seen, as was an adult ram with a nice set of horns on this trip. Unfortunately, the moose population disappeared with a liver disease years ago. 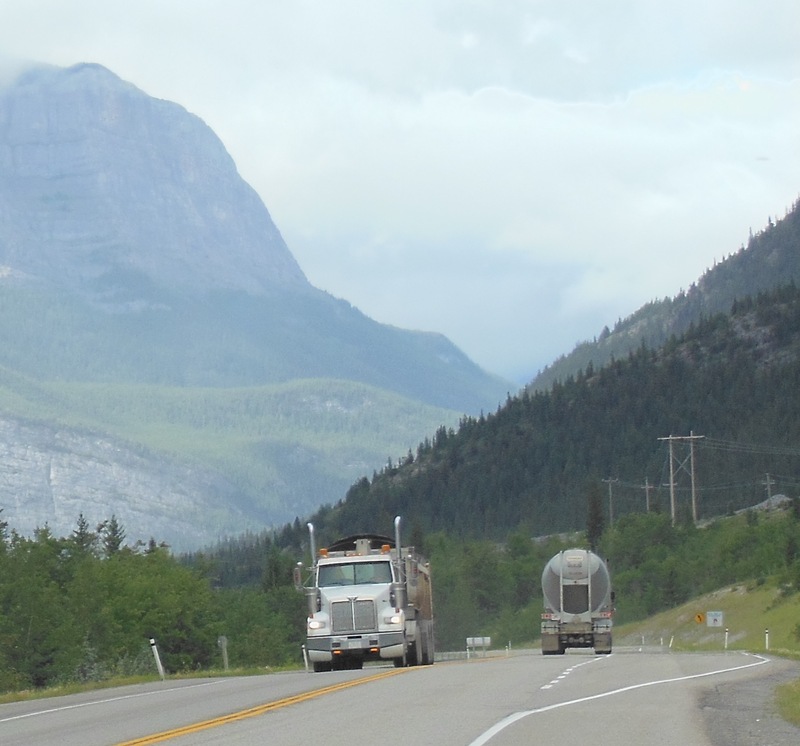 With speed limited to 60 kilometres and the faster Trans-Canada Highway a couple of kilometres away, the car traffic tends to be light. 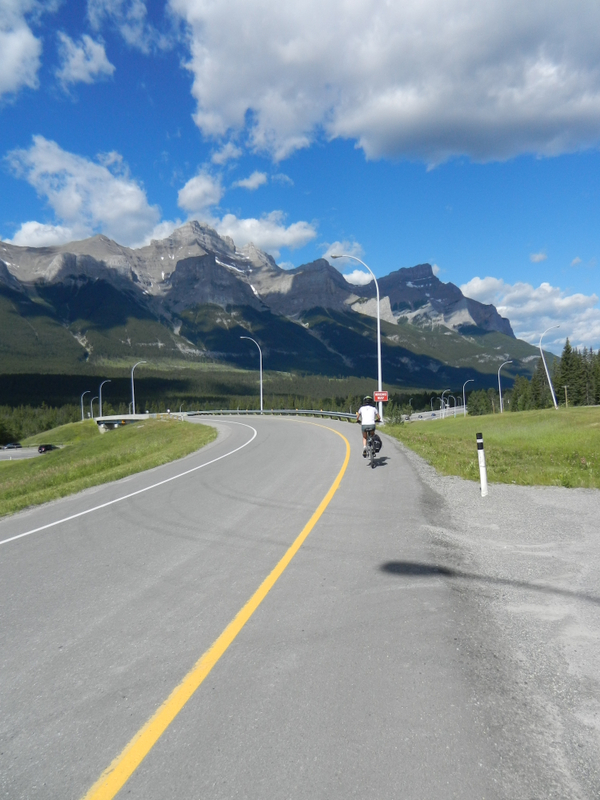 It should be noted that there are restrictions for passage on the parkway for car drivers and for cyclists depending on the time of the year as animals do feed in this area. 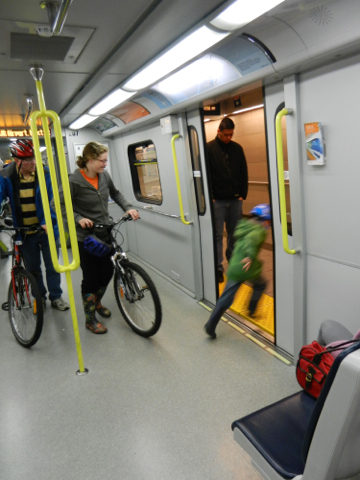 There are options for cyclists. 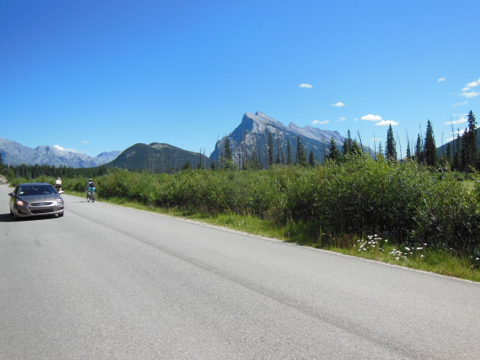 One can cycle the full way to Lake Louise and then double back or take the Trans-Canada Highway back providing a quite different view. 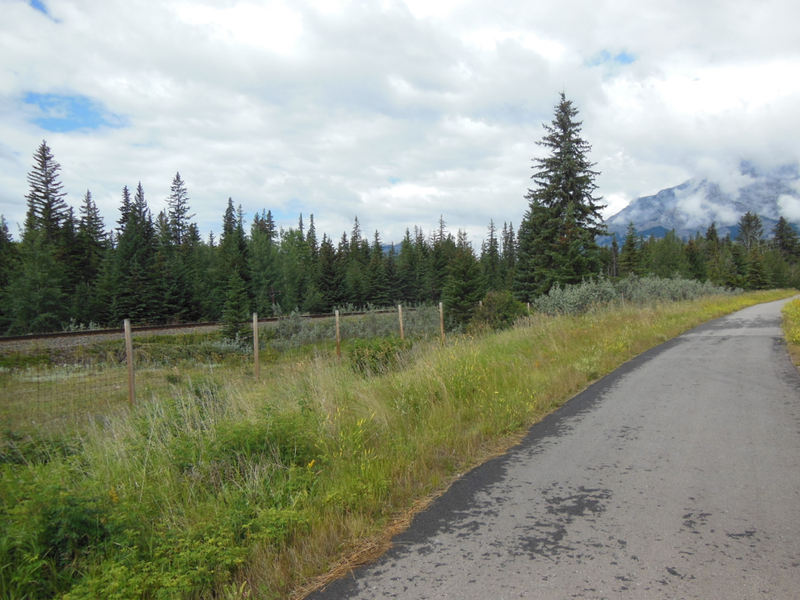 One can also cut over to Highway #1 at Highway #93 at Castle Mountain. 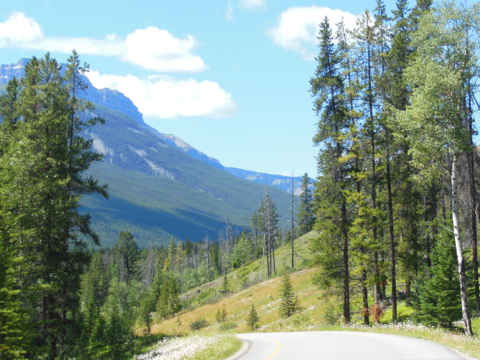 Along the way the mouse meadows, Johnston Canyon, Castle Mountain, and Baker Creek will be passed or can be places to spend sometime at. Cycling back to Calgary today was a pleasant experience with a strong tailwind. There was a long section of highway with a small upward incline. 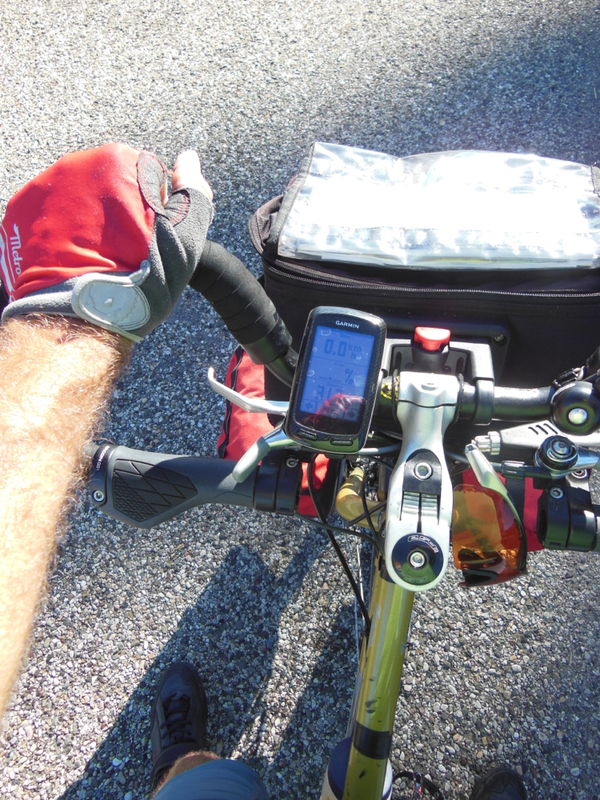 I had stopped pedalling and still was sailing along at 24 kilometres per hour after a kilometer or two. Now if all trips were like that, the exercise value of cycling would go down but the trip would be very enjoyable. The next blog will give some comments on the design of the trail. 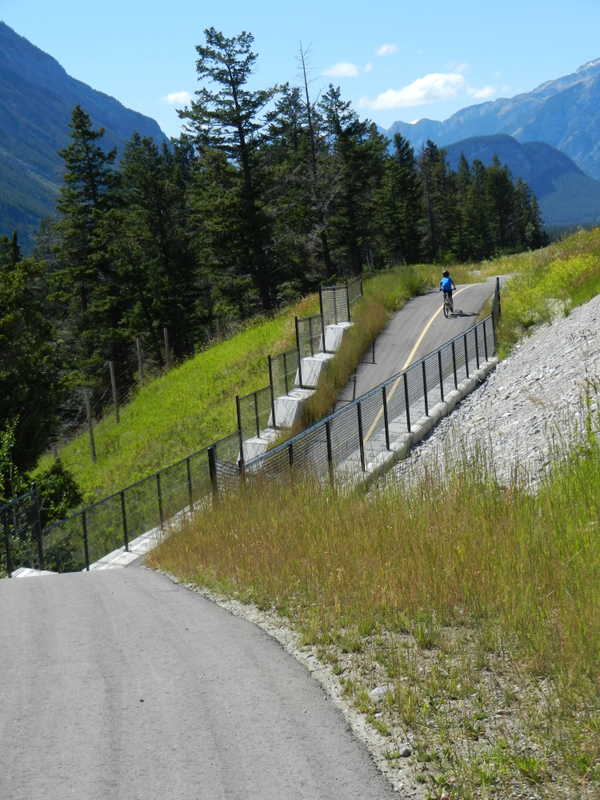 As mentioned in the last Banff Legacy Trail blog, this trail provides opportunities for all type, cycling skills, and age of cyclists to enjoy the wilderness along with hikers, in-line skaters and those with rollers on their skis using poles to propel them up hills. 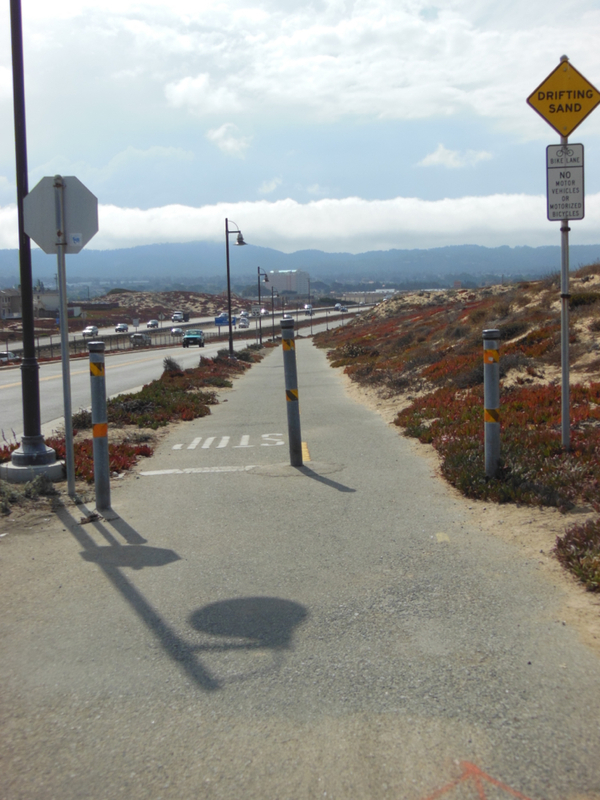 Traffic can become heavy along the trail to a point where one wishes that the trail were wider. 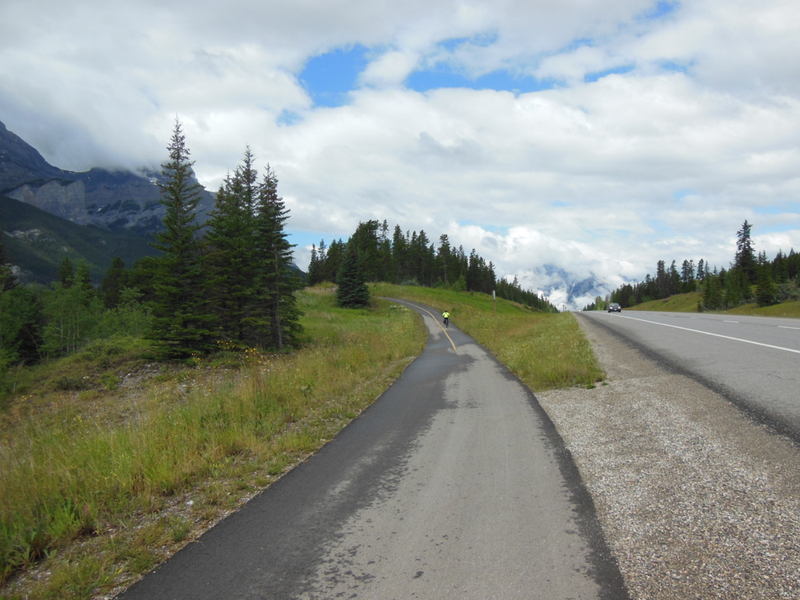 There is a wonderful feeling cycling at 1,400 metres elevation. The air is clean and fresh. The mountains are majestic. Boredom is difficult to encounter. 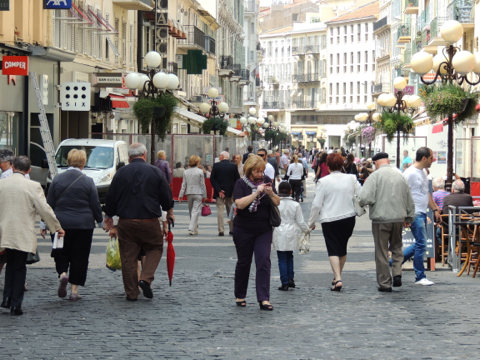 There is a sense of separation from daily life encounters. There is this luxury of one seeing these mountains within the mental reach of one’s mind, without the physical effort of actually climbing them. 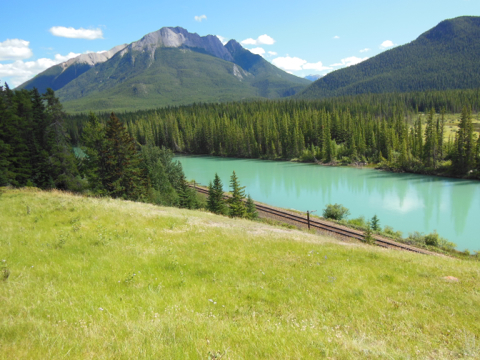 There is a continuum of stunning views on both sides of the trail. Cycling provides time to enjoy and take in each view, to savour it, not rushing by in a car where a one second view may all to be had. 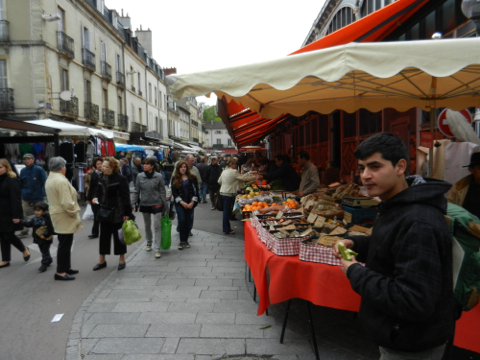 There are resting areas along the way and opportunities for stopping and taking photographs. There is not a shortage of subject matters from the mountains, the valley, the streams, trees, and flowers. Even a passing railway train propelled by 4 or 5 engines and camouflaged by some trees is a picture opportunity. 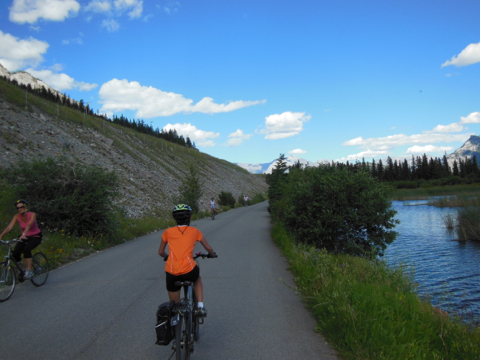 There is a sensation that the scenery is being enjoyed as if one is couch-surfing rather than cycling the trail. 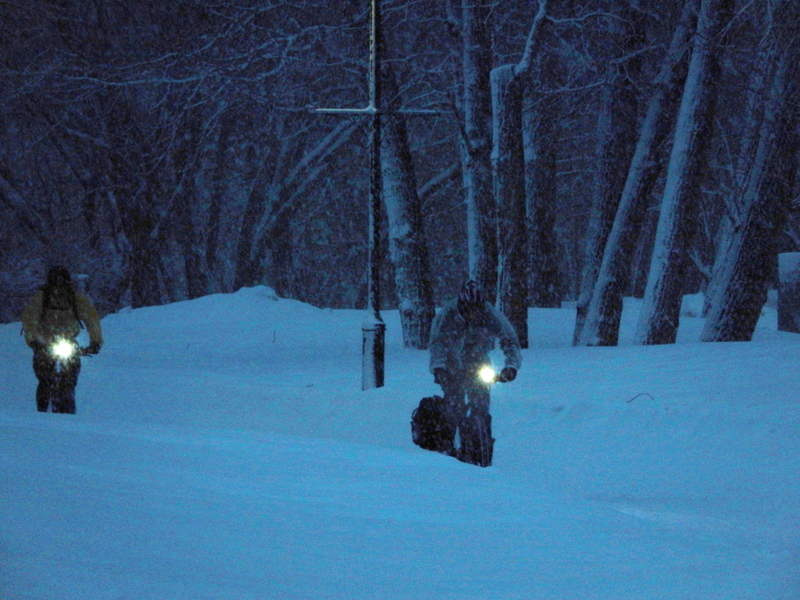 Now some cyclists, who use their bicycles infrequently, may not quite appreciate this feeling. Observing the enthusiasm of the young cyclists on the trail, 8, 10, 12 years old or so, cycling here cannot be that strenuous. 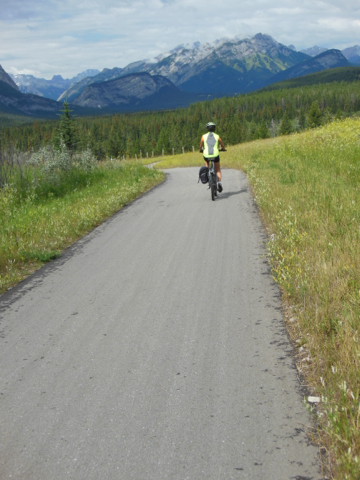 Over the length of this ride, the elevation gain is about 30 metres overall. 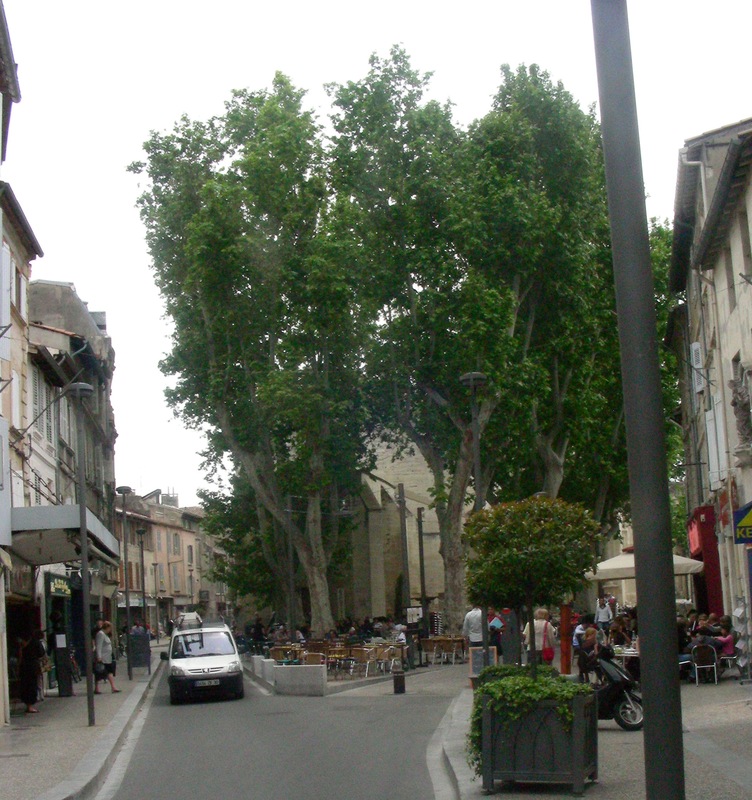 However, one does need to climb about 135 metres along the way. 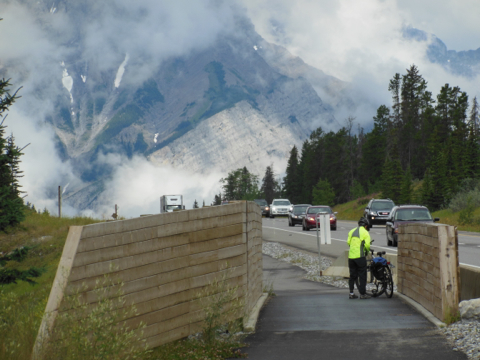 After leaving the Banff Park East Gate along this paved trail, one is quickly challenged with a climb. The vertical elevation change is about 30 metres. Now, I do not quite understand why there is this climb considering that families with very young children cycle here or pulling children on a trailer. 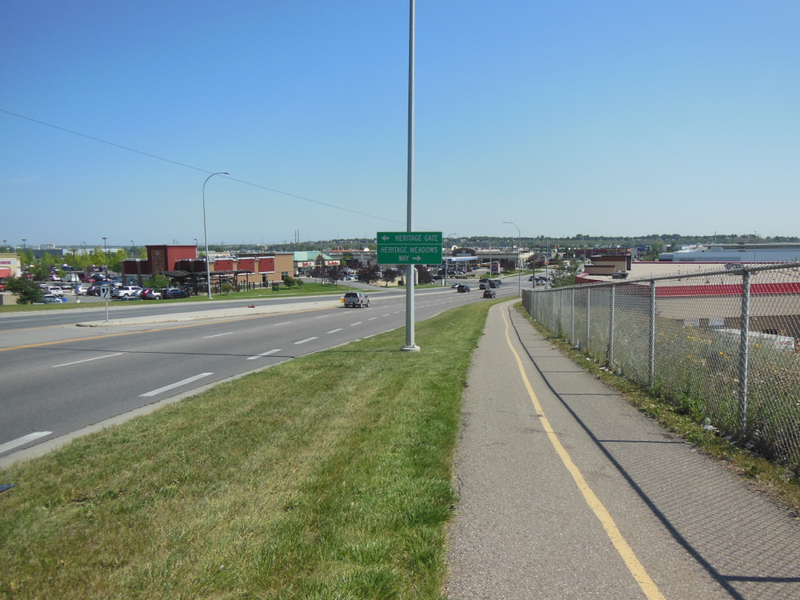 Certainly, a less demanding, lower grade path could have been built alongside the highway ditch to the top of this incline. Coming from the west, the approach is much more doable. 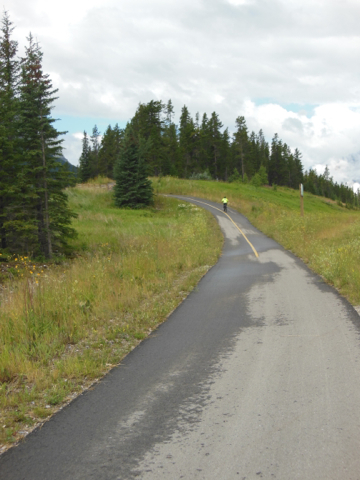 Nevertheless, a climb needs to be made on bike or by pushing it up the hill. The climb. Out of effort. Pushing the bicycle up the hill. The descend; a warning sign, a curve ahead. 2349 – No bridge. A rush instead with a fast descend. Usually, when crossing a creek, the cycling solution is to span the creek with a bridge. Along the Legacy Trail, there is an old creek bed to cross. Instead of a bridge, the trail designers decided to drop the trail sharply into the old creek bed. 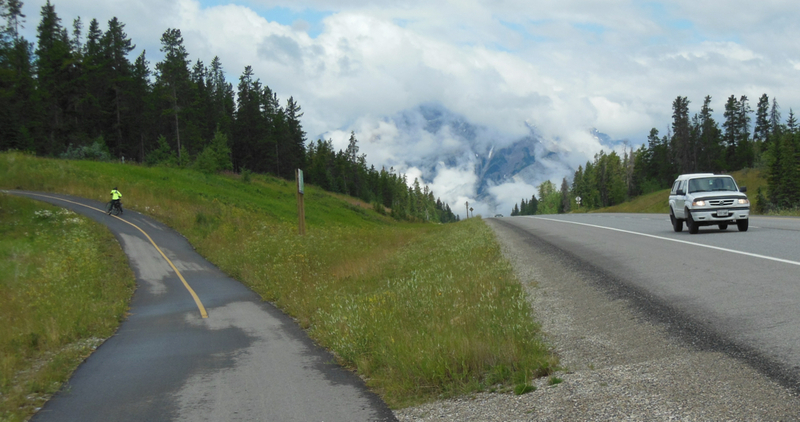 Both the drop and the rise on the other side are steep, so steep that the speed picked up on the way down is sufficient to almost get a cyclist up to the crest on the other side without much pedaling, even in high gear. So, to ensure that the experience crossing this depression is more exiting, the trail designers added a couple of sharp curves on the way down into the design. Rest area; tables for relaxing. 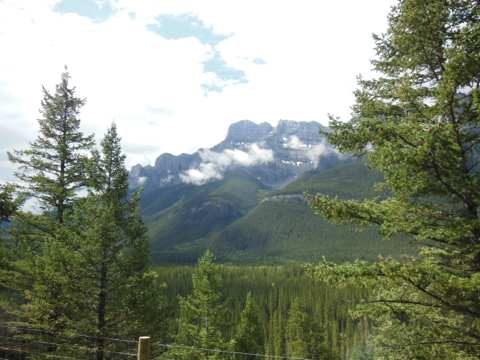 About 7 kilometres along the trail one comes upon civility with a stunning view of the mountains. 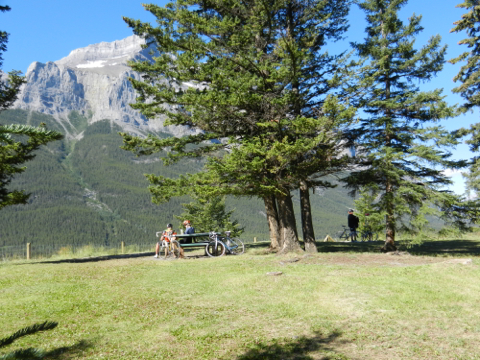 Within a treed area, the Valleyview picnic area provides tables to stop, rest, enjoy the scenery, or share some food. Toilets are provided, as well. 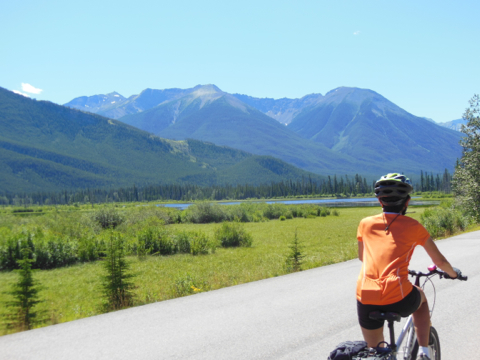 As one cycles towards Banff, one is always looking straight towards a mountain, while flanked by the two mountain ranges on each side. First it is Cascadia Mountain with a peak at 2998 metres and then it is Mount Norquay, the skiing mountain, with an elevation of 2522 metres. 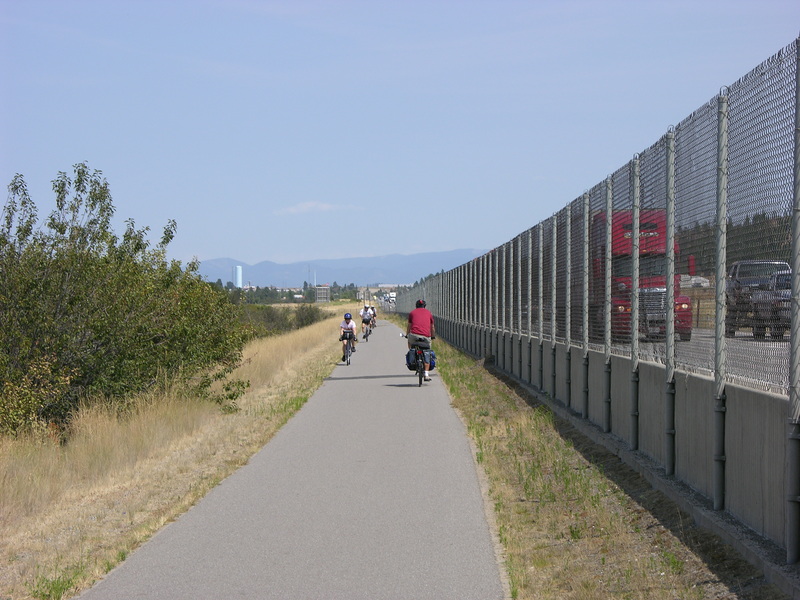 Wall separating Legacy Trail from the highway traffic lanes. 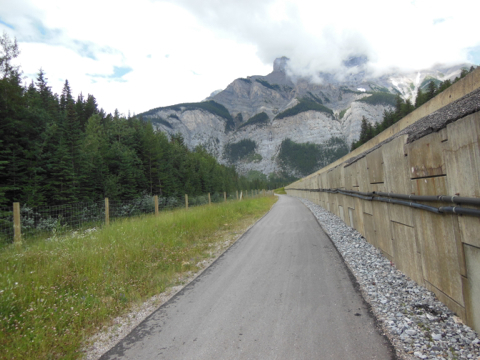 At one point, the trail drops below the elevation of the highway, separated by a retaining wall. Animal control gates. Keeping animals off the highway. Cyclists passage over electrified mats. 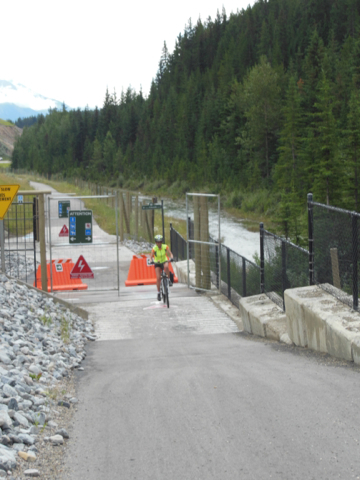 At the point where the Cascadia River crosses under the highway on the way to Lake Minnewanka, a set of gates appear. Sometimes when we are in wilderness areas, we forget that it is ranging grounds for elks, deer, mountain sheep, bears, and other creatures. Unfortunately, separation is required so that these creatures are not the victims of cars and trucks. So, these gates are intended to keep animals from entering the roadway. Hikers proceed through gates marked for them. 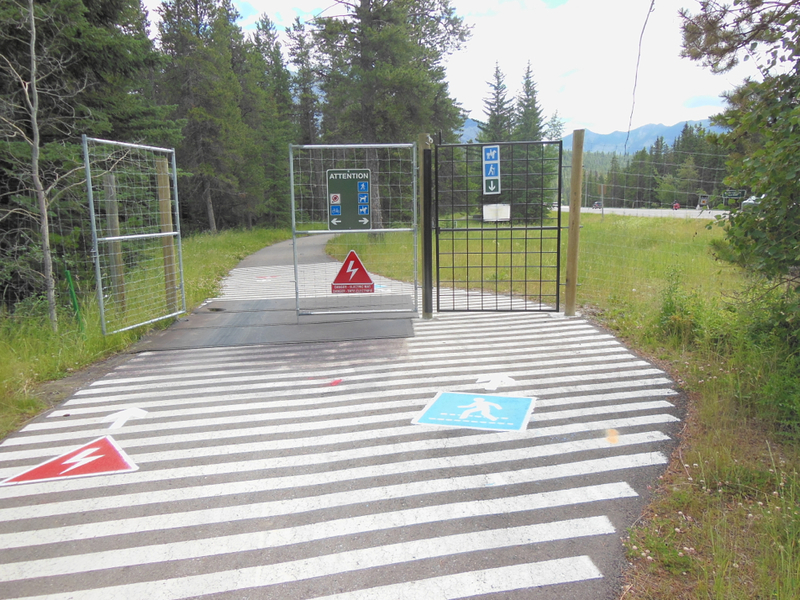 Cyclists proceed through a gate with a mat on the ground. The warning signs indicate that cyclists should not stop on these electrified mats. 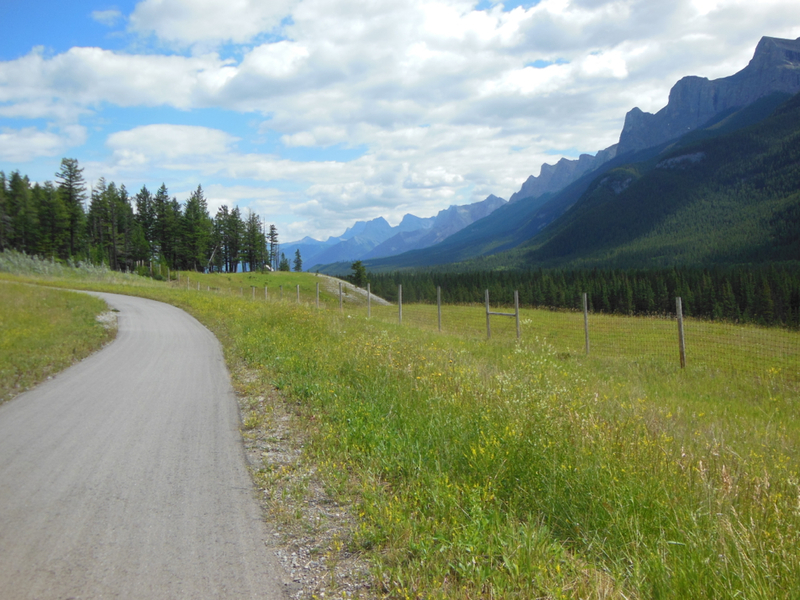 The trail to Lake Minnewanka. Cyclists have an option at this point. 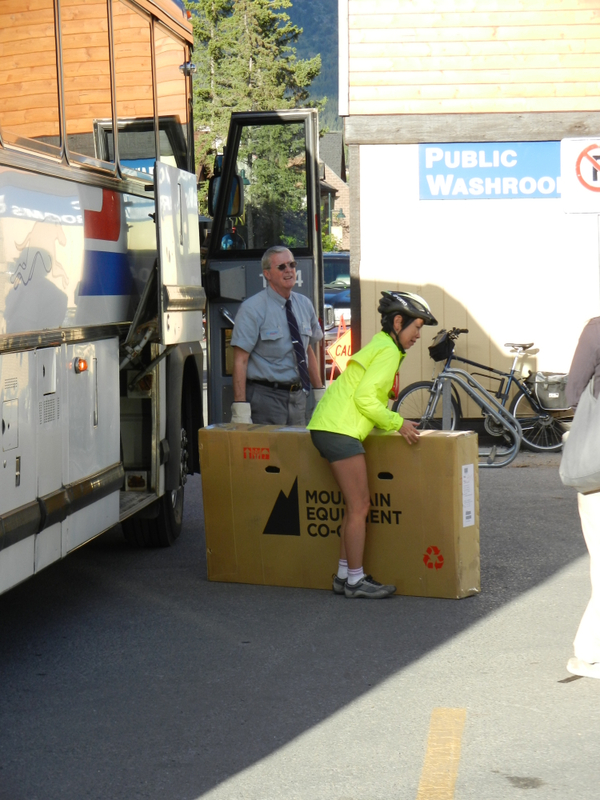 They can continue to the Town of Banff or do a circular cycle passing Lake Minnewanka and Two Jack Lake. Big horn sheep enjoy sitting along the side of the roadway by the lake. 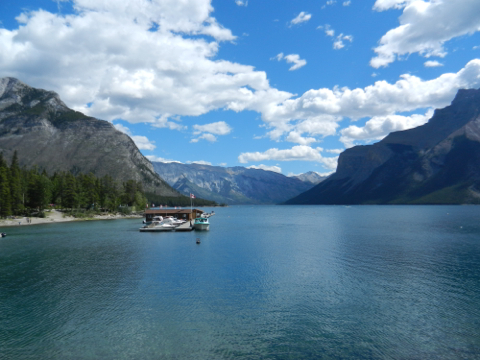 There is opportunity to take a tour boat down the long lake. 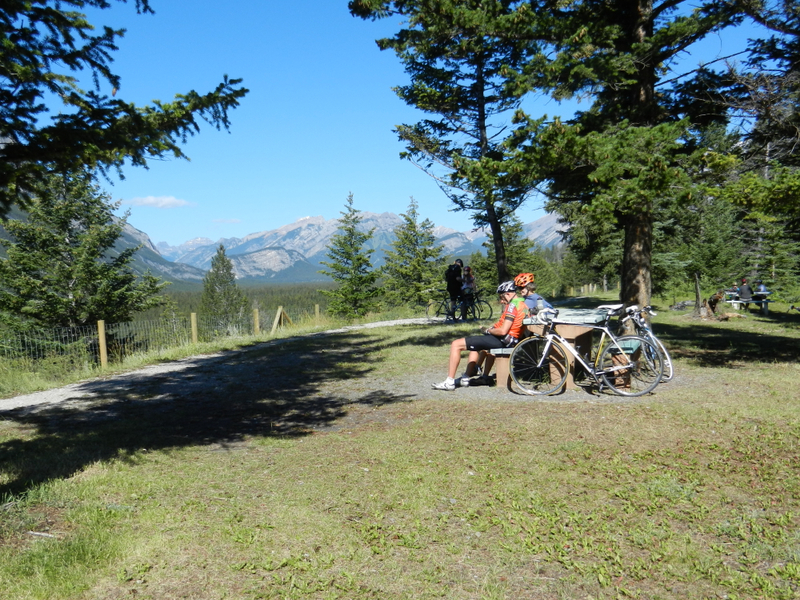 The cycle is pleasant with lots of climbs and descends and places to stop and picnic or rest. One can tie up one’s bikes at a trailhead and share a walk with the sheep. This is cougar country. 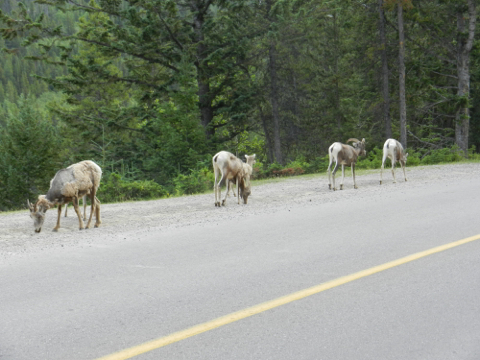 Lake Minnewanka Road – Big horned sheep on road. Separation – Grass patch, a mountain always straight ahead. 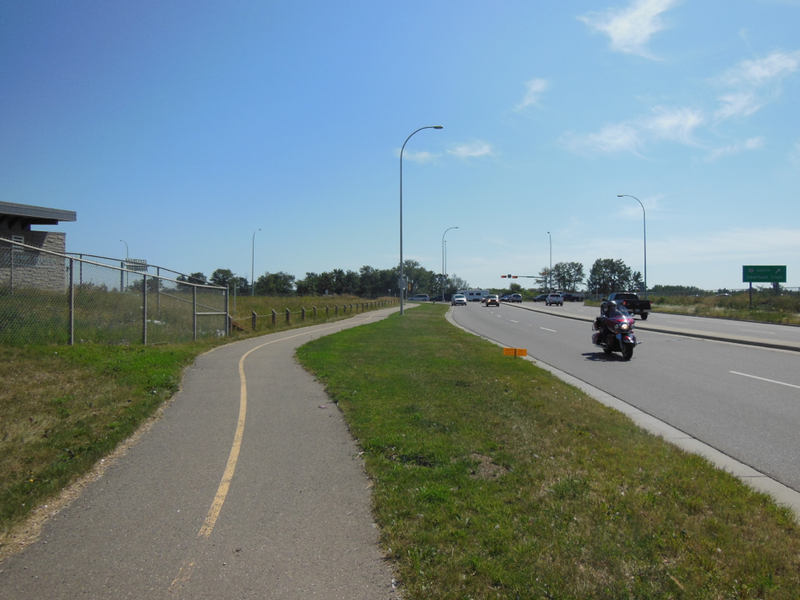 For most of the way, the Legacy Trail is set a few metres from the roadway. For some sections, the trail is closer. Separation may be by concrete barriers or by gravel strips. 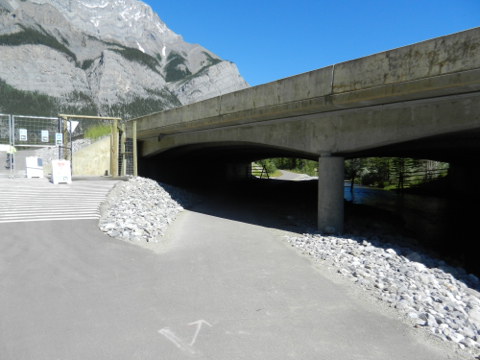 Passage over creeks is by separate bridges with sidewalls the height of cyclists blocking crosswinds. Separation – concrete curbs, gravel strip. 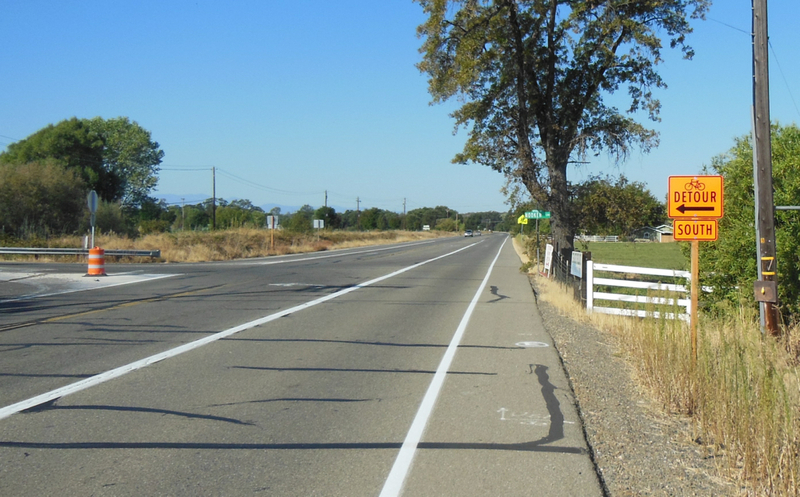 Separation – Grass strip supplemented on road bend with concrete barriers. 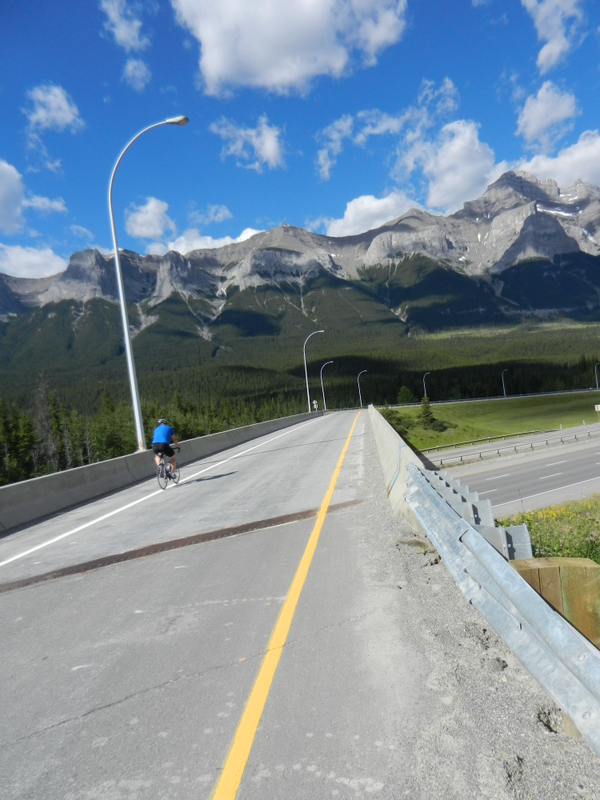 Separation on bridges with side walls almost the height of a cyclist providing crosswind protection. 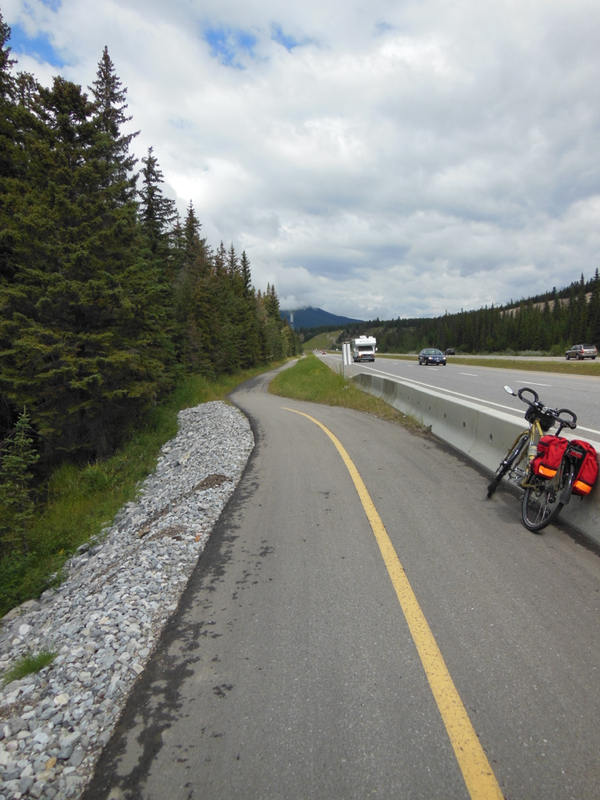 On the way back to Calgary, there was a reminder that cycling on separated paths by highways is more pleasant than cycling on road shoulders no matter how wide they are. 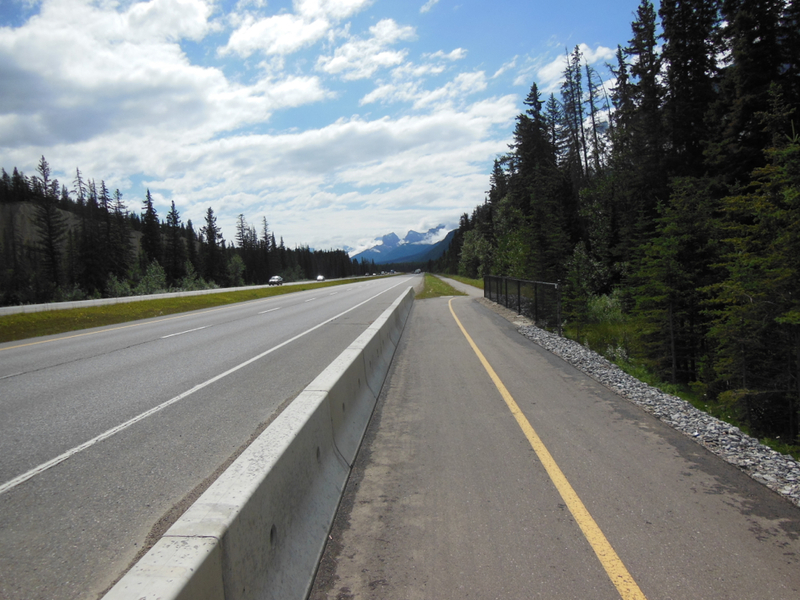 Certainly, the Trans-Canada Highway has wide shoulders with cycleable rumble strips. The maintenance of the shoulders for loose gravel is not bad. The shoulders also have pieces of rethread truck tires scattered about. With rethread tires comes steel pieces torn from the rubber through the tire separation process. 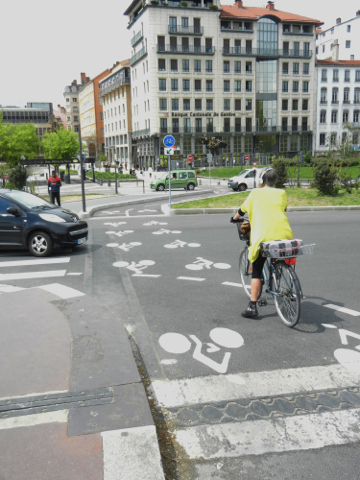 These difficult to spot pieces are not cyclists’ friends, especially touring cyclists. As we ended out trip, we noticed that the front tire of my partner’s bicycle was flat. In the front tire there stuck such one of these steel pieces. Good thing that the tire casing held the air until we reached home. Who wants to fix a flat en route? 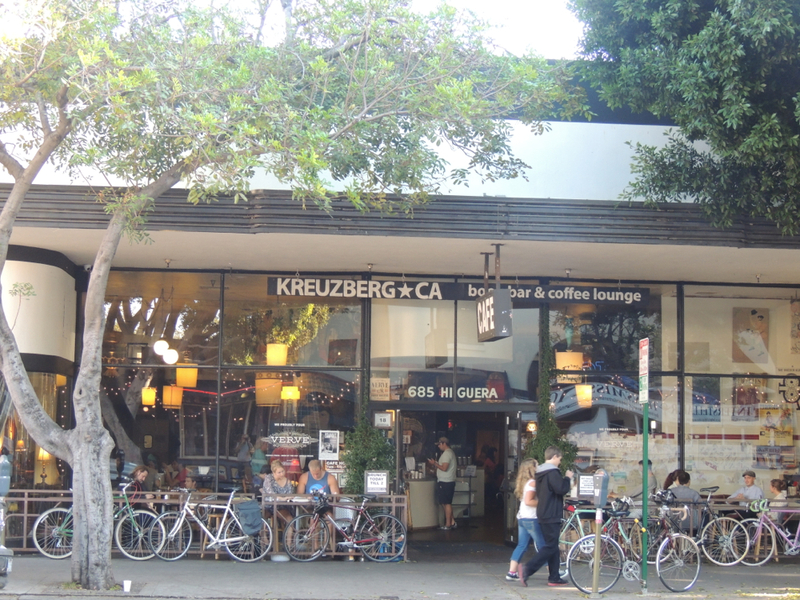 Then, a day later, I noticed that front tire on my bicycle was now also flat. Two tires damaged by these steel pieces from cast-off rethread tire segments on the highway shoulders, just too much. 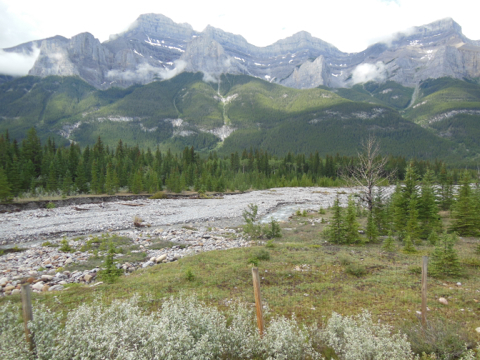 The waters of the Bow Rivers descends from the Bow Glacier north of Lake Louise down this valley past Banff, Canmore, and Calgary on its way to the Arctic Ocean. As in any valley in the Rockies, the wind tends to be predominately from the west. 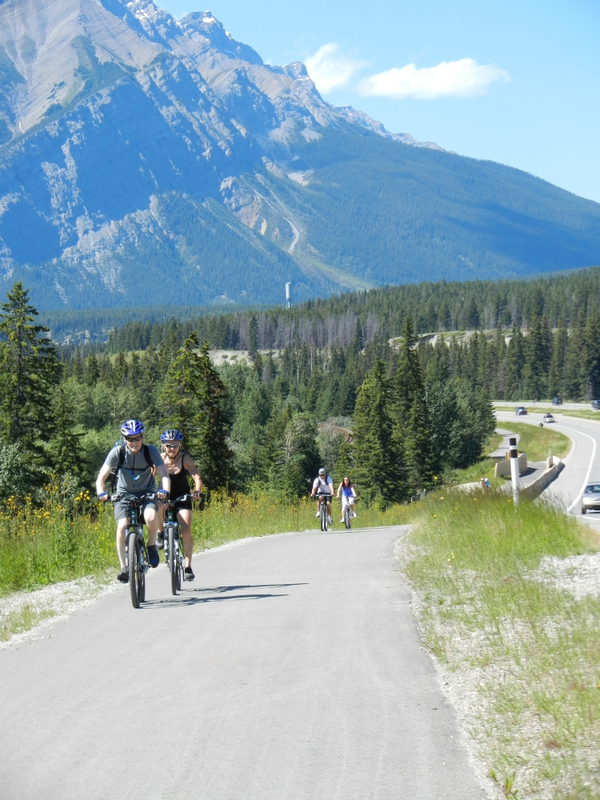 So, it is natural that the cycle to Banff may take more time and effort. 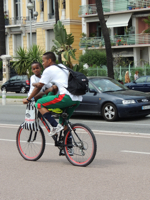 One just needs to focus on the return cycle with the wind in the back and the cyclist’s body acting as a sail. Summer creeks; low water level; wide creek bed; glacial till. Mountain creeks, with their little water flow in summer, cross under the Legacy Trail. Their wide paths are littered with glacial tilt and stones. One can easily imagine the torrential flow of water down these creeks in the springtime during snow runoff. 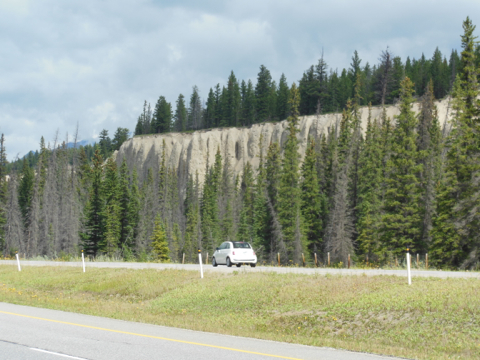 The Hoodoos, a nature’s creation. Mother nature likes to take time as an artist and produce impressive works of art. So it is along this trail. Just before the hydroelectric plant by the Cascadia River, on the east side there is a stretch of inspiring hoodoos. Geological hoodoos are weathered rocks sculptured by the action of water, ice, and weather. Banff AB. Banff National Park of Canada. 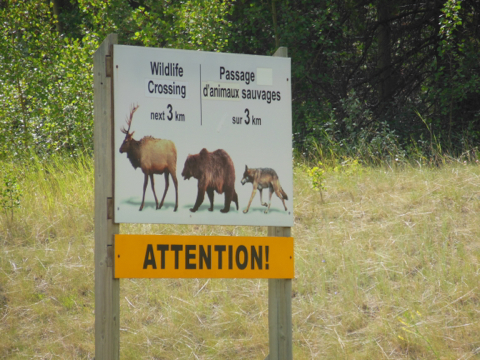 As the trail reaches the limits of the Town of Banff, another set of animal gates appears along with a sign indicating that animals may be present. 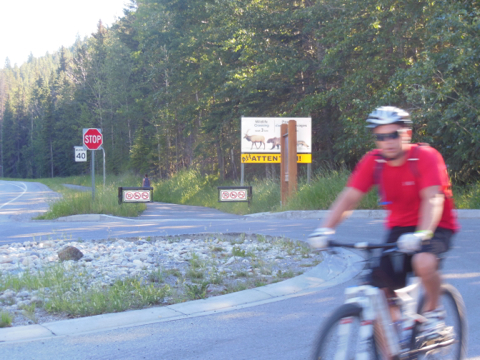 Then a road crossing happens with stop signs on the trail and the side road. 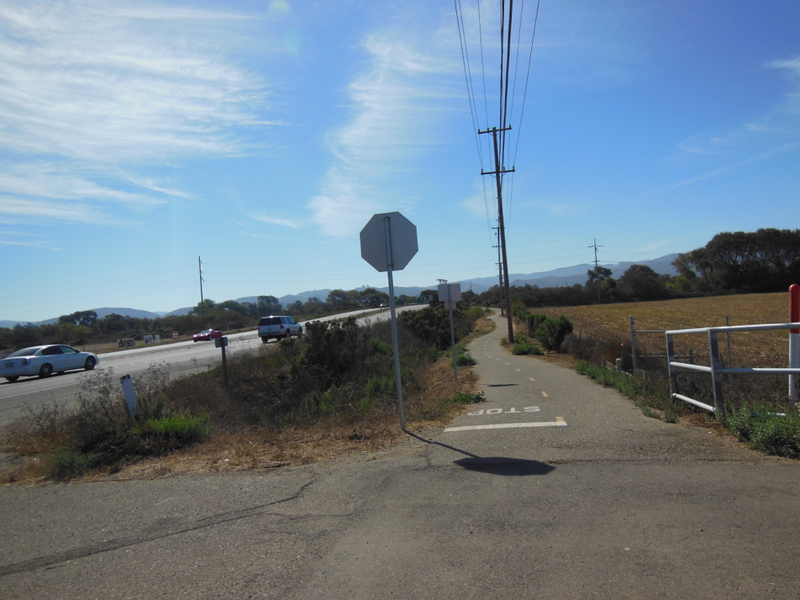 Finally, the separated trail ends at a bus turnaround at the town limit. 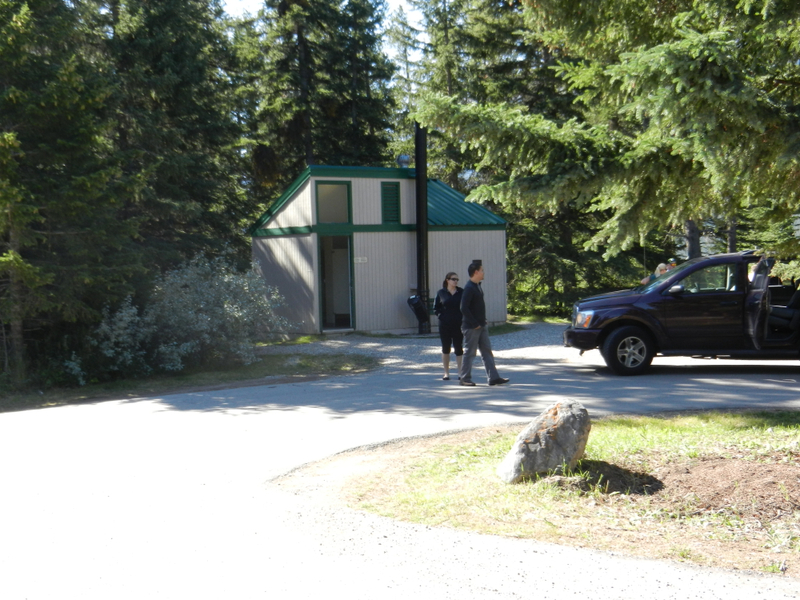 Animal control gate in Banff. 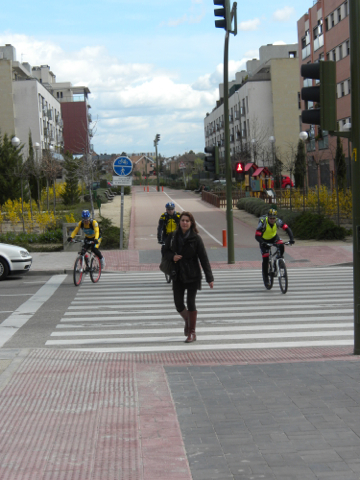 Cyclists crossing an intersecting street. 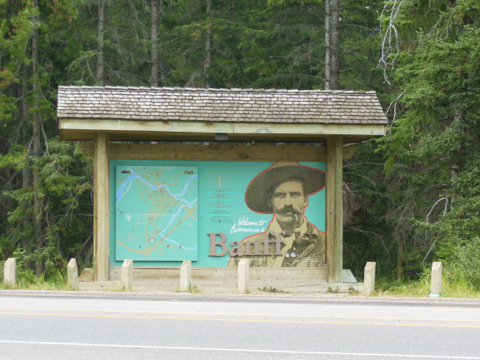 Banff trailhead at the Roam, the town bus turnaround. 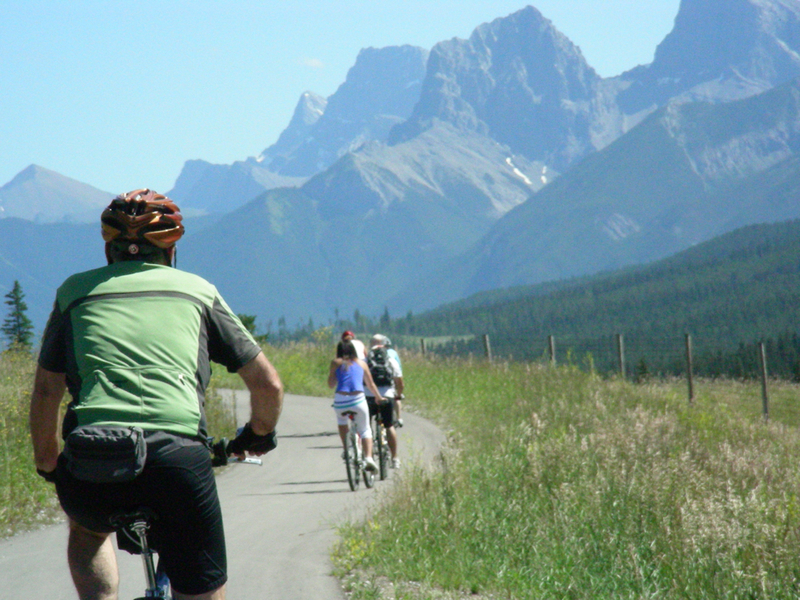 Now that you are in Banff, what next? More on the next blog next week.